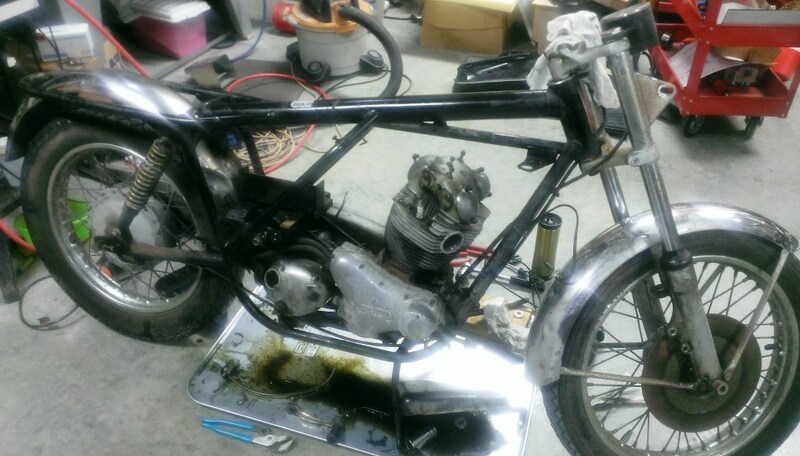 I have a numbers matching frame, engine cases, gearbox cases, and title for a 1974 Norton 850 Commando Roadster. I also have leftovers from the 1972 750 rebuild that will make a complete gearbox and engine bottom end. Clearly, I need a lot of parts to finish the bike. August 16, 2018 I won an almost complete 1974 850 untitled Commando today for much less money that it should have commanded. So, now I have what I need to build the bike. The parts bike is being delivered this Sunday. August 18, 2018 Starting on the cases. I've stripped, degreased, and inspected them. I might decide to send them to be cleaned rather than do it myself, to speed things up. I can make them beautiful myself but it takes time. The cases are in good shape and almost all threaded holes have already been helicoiled so that headache is resolved. A lot of decisions will rely on the condition of the parts bike arriving tomorrow. August 19, 2018 The parts bike arrived. It's a little rougher than I hoped, but will get the job done. On quick inspection, the tank and side covers look OK but not original paint and all chrome parts are junk. Check that! The tank and oil tank cover are original paint but the pinstripes have been polished off the tank and the side cover has been painted over without removing the decal! The drive-side cover has had a hole drilled to mount the master switch so it's not of much use to me. As I disassemble I'll figure out what parts are needed. August 21, 2018 I took lots of pictures yesterday and today but I guess the lens on my phone was smudged - this is the best one of the bunch - certainly nothing to be proud of! I did send the engine cases and oil tank off the CNW. They will install their breather and cleanup the cases - saves me time. The oil tank has a broken rear mount which I could have fixed, but since I was sending the case, I sent the oil tank for their service on that too. August 22, 2018 I took lots of pictures today using a fancy Nikon camera. Generally, the camera does a great job and won't take a picture if it has a problem like no being in focus. Unfortunately, today I found out that it doesn't mind taking pictures without a memory card! 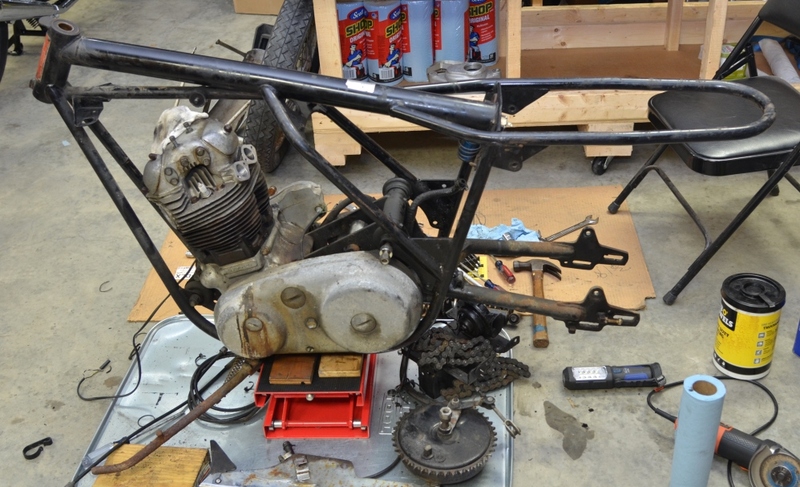 The parts bike is on a jack now and the rear wheel, fender, and battery box are out. The power unit should have been out, but the front end is giving me fits. It took a while but I have the top fork nuts off. When I tried to remove the wheel, I couldn't get the axle nut loose. My pneumatic impact wrench won't move it even after heating it very hot. I'll try more tomorrow, but I might end up drilling it out. August 23, 2018 The first picture is where I started today. The second, where I left off. Between was a lot of struggle! 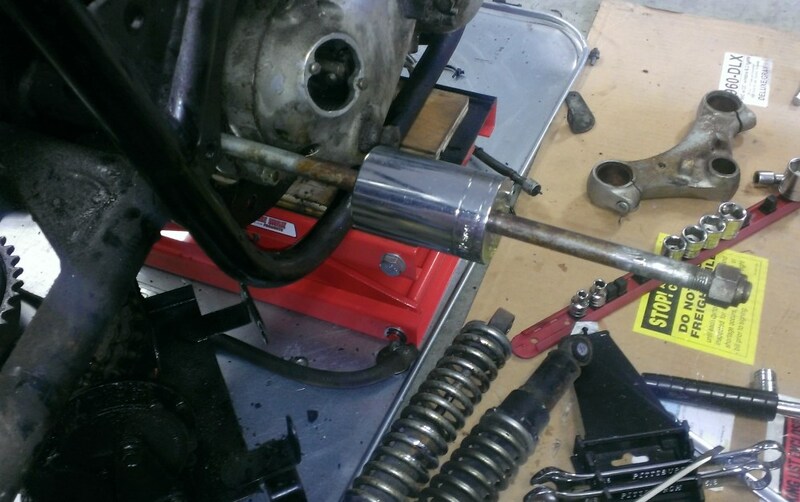 I used a long old-school torque wrench on the front axle nut - at 250 ft pounds, the socket failed! Then it was a 14" adjustable wrench and hammer. It finally cracked loose. Getting the fender off and fork tubes off has easy enough. I need to know at every step which parts are good, so I disassembled the forks. The right side internals look brand new! The left side internals are a rusty mess and the bottom of the left side slider is broken. 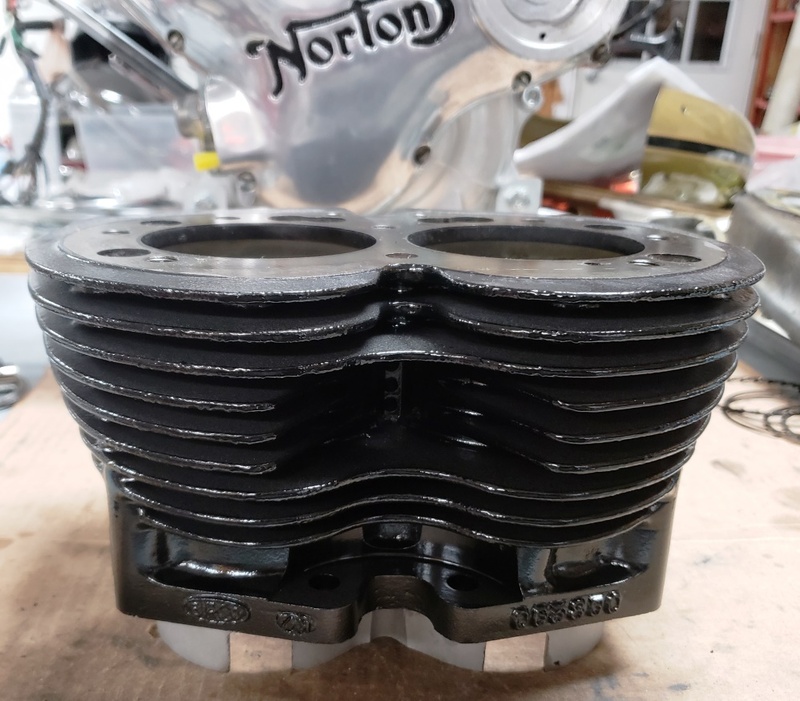 Fortunately I have some good spares from the 1972 Norton I recently finished. Getting the bottom of the triple tree off was a nightmare! I have bad shoulders and swinging a rubber hammer for a long time does not help! Then to the rear end. Getting it as far as you see it was easy. The swingarm spindle is stuck solid. I'll try to find a long bolt with the right threads tomorrow to use to make a puller. I have a bolt I've used to pull them before but it's only 2" long and I need at least 4". Once I get the swingarm off, I'll put it on the table on its side and remove the power unit from the frame. 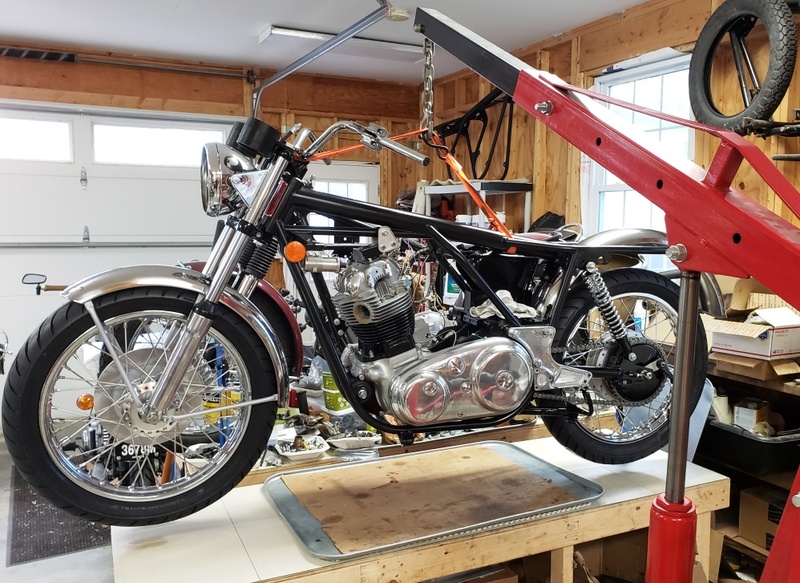 August 25, 2018 I worked two hours yesterday on the swingarm and then three today until I finally got the spindle out. 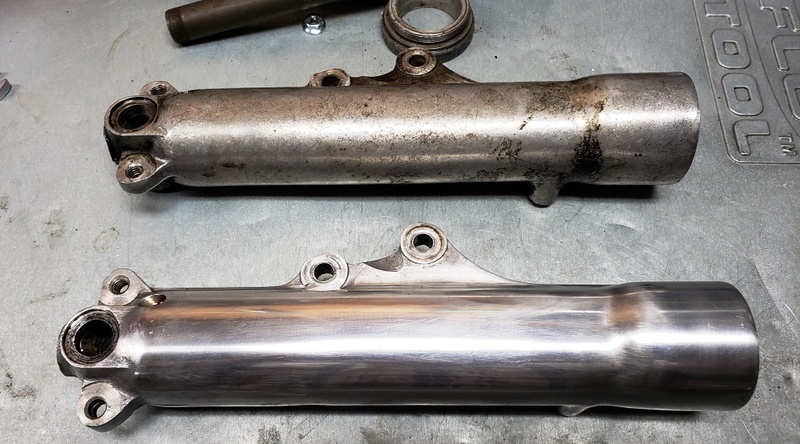 When Norton said to use 140W oil and not grease in the swingarm, they knew what they were talking about! 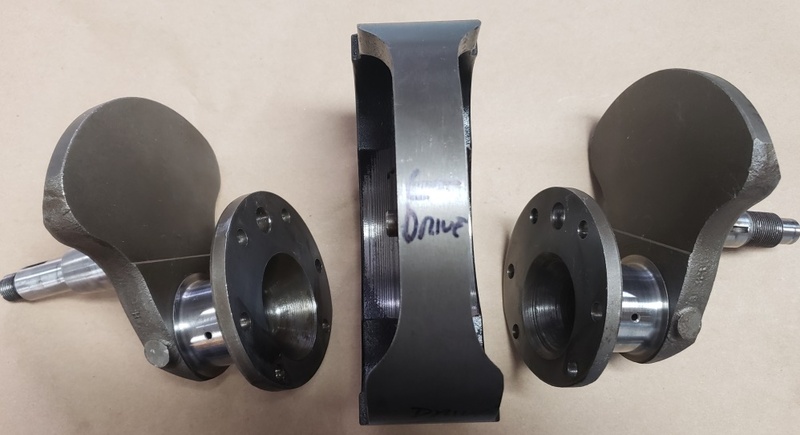 This swingarm spindle was full of grease, but none of it got to the bushings or between the steel of the spindle and engine cradle! 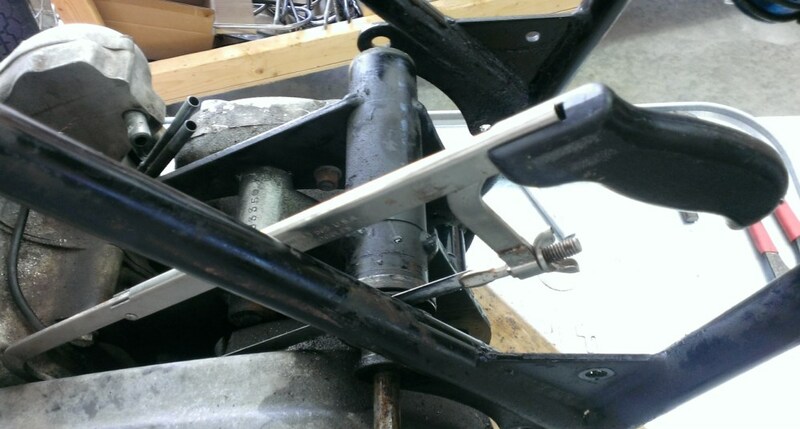 The first picture shows a redneck slide hammer that should have worked - it didn't! The second shows the redneck puller I rigged up. I wasn't strong enough to get it to come loose so I used the second wrench as a persuader. It finally moved. Then about an hour of cranking on it and adding spacers and it finally was out. Remove the rear isolastic stud and replace it with a smaller rod. 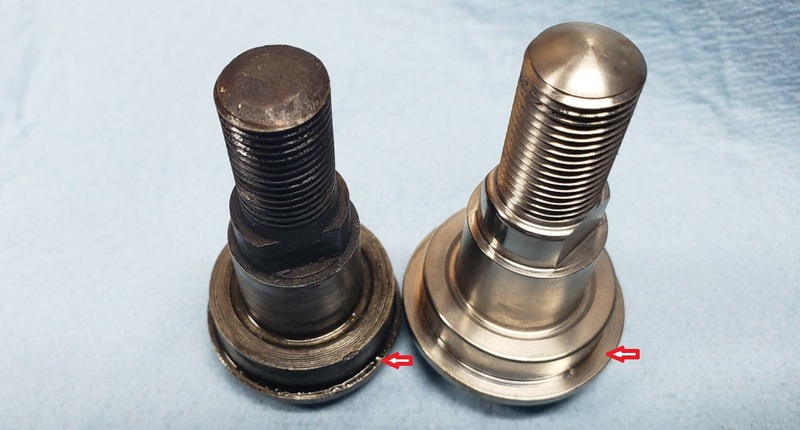 Remove the front isolastic bolt and replace it with a screwdriver. Then I'll lay the bike on its drive side, remove the entire front isolastic, the rod from the rear, and lift the frame off the power unit. From there, the engine will be easy to take apart using the engine/gearbox cradle as an engine stand. August 26, 2018 The war continues! My easy sounding steps above did not happen! The rear isolastic stud was frozen to the tube inside the frame. After a lot of beating on it with a hammer and making all sorts of redneck pullers, I decided to cut both sides off. There wasn't enough room to use my cutoff wheel with the guard in place and it was too dangerous without the guard so it was hacksaw time. So, I slipped the saw blade between the isolastic plates so neither the frame of engine/gearbox cradle would be damaged. In the first picture, the timing side is done and I'm halfway through the drive side. Once I got over that work (hot and humid out), I fought the front isolastice mount - some idiot had WAY overtightened it. Once I finally had it out, I was able to lift the frame off the engine/gearbox. I really wanted the engine apart today so I pressed on. The head was a nightmare - Norton heads often are. Once I finally had all the bolts and nuts out, the head was off. The front drive side stud was missing. Internally, the head looks good. The right side exhaust port threads have been repaired by welding and re-cutting but it was done well. The front drive side stud is broken off flush with the top of the cylinder block. I guess that same over tightening idiot was at work on the engine. The bores look great. I'll mike them and I hope they don't need bored. I'll use new rings in any case. The engine was completely wet sumped. A good thing in this case. The primary and timing area were full of oil. The clutch looks new. The primary chain was EXTREAMLY tight. Hopefully it wasn't run that way. The sprockets look OK. In the timing side, the idiot struck again. The oil pump drive gear/nut was so tight that it would not come loose. I finally used a 15" breaker bar with a fork tube persuader and got it loose. Then came the cam sprocket nut - same problem, same solution. Sorry no pictures of most of this - I was so tired and sweaty that I simple forgot to take them. So, I have to pull the clutch center and crank drive sprocket and remove the inner chaincase. At that point, I'll take the rest of the engine and the gearbox out and finish the engine. 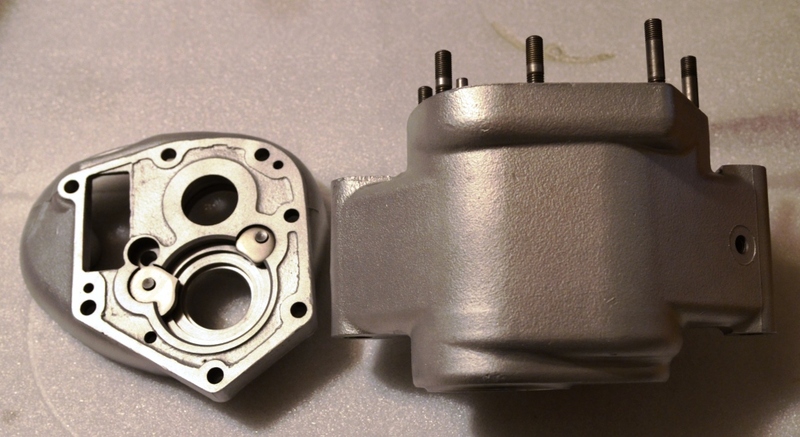 The crank and bearings feel great so I'm hopeful that I can start assembly as soon as the cases come back from CNW. August 27, 2018 The "feels like" temperature was 101 at 6pm today! I figured I would quickly get the clutch and front sprocket off - think again! The clutch center pulled very easily. The front sprocket still isn't off. It's normally very easy to do on a Norton but this one is really stuck on the taper. So, I left the puller on it under tension and hopefully it will come loose overnight. August 28, 2018 The only thing accomplished today was getting the front sprocket off and then the rest of the primary. The inner primary cover is toast. The integral chain guard is broken off and the sealing plates are bent and loose and there is no felt seal. Although I could have replaced the sealing plates, I wouldn't sell this to anyone with the chain protection gone. September 1, 2018 The heat wave continues and I've been busy with other things anyway. I did spend most of the day on it today. The engine is all apart and the initial cleaning of all parts is done. The cases will be sold along with several other parts. The cases have no issues. Like everything else on this bike, everything was very hard to get loose. Apparently the last person to work on it has no "feel" for tightness and certainly doesn't have/use a torque wrench! September 2, 2018 On Nortons, there's no way to know for sure if the crank is full of sludge so I always take them apart. Also, even though the big end shells feel perfect, I always check the journals and replace the shells - they don't cost that much. So, first step is to take the conrods off. The journals are beautiful and the micrometer says no wear. The conrods are in excellent condition. Take a look at the second picture - the last person to work on it didn't bend the tabs! But just to be a PITA, he used red Loctite on one side of those of the nuts - what good is that! It looks like the engine was run very little after being apart the last time. The bike was last registered in 1987. Took the gearbox apart today, the oil looks brand new. I don't know if the gearbox and engine were done at the same time but I suspect that they were. I have some leftover parts from the 72 and from this parts bike. I have a couple of people interested in the parts. If they don't buy them, I'll list them here for a while and if they still don't sell, they'll go on eBay for higher prices. 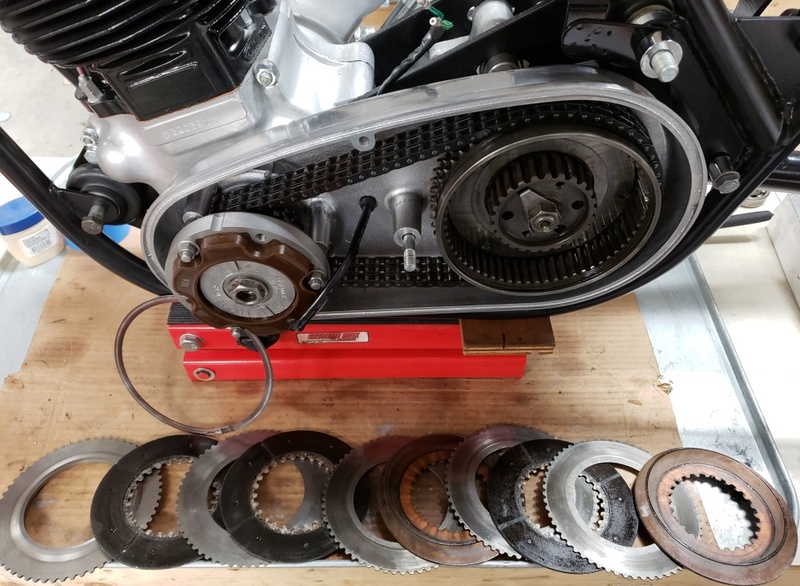 September 3, 2018 I have a complete gearbox from the extra parts with the 72 Commando, and one from the 74 850 parts bike. 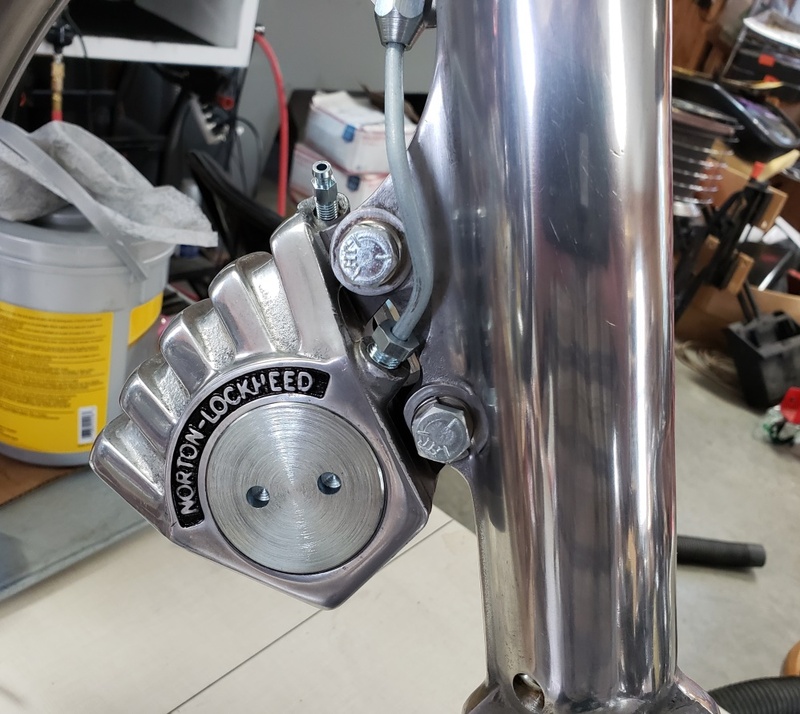 I also have the matching numbers gearbox case for this bike. 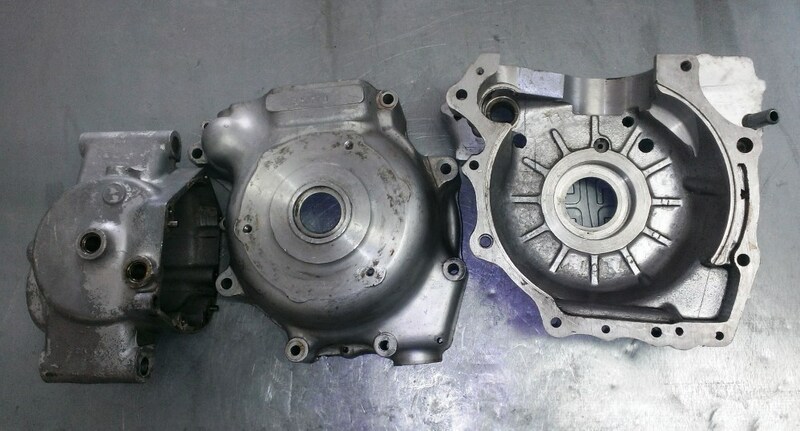 So, the bike will be built with that, a complete gearbox will be rebuilt and sold, and the left over cases will be sold. 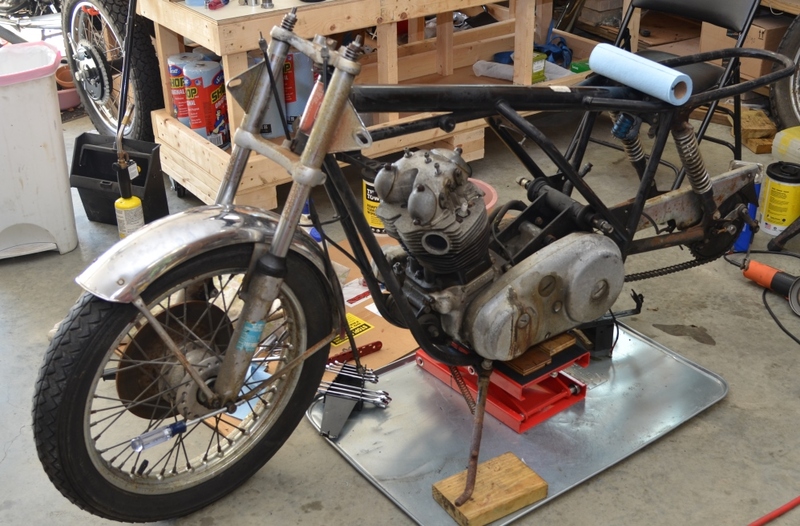 I intended to build the gearbox for this bike today, but first I need to pretty up the cases. I did the first few steps and then realized that I'm out of glass beads. They are needed to peen the cases as the next to last step of making them look good. So, the beads are on order. I did clean and inspect all the gearbox parts. Everything looks perfect except that the kick start shaft has a small crack. It probably would work forever, but I won't use it. A new one from Andover Norton is expensive, but then so are the ones from India. I'll keep looking for a good used one since I have a good one from the other gearbox. September 6, 2018 Super hot again today, but the beads arrived so the building phase has begun. The gearbox case and inner cover are now beautiful. They look good in the picture, but in person, they look even better. My big Andover order (over $1800) still has not shipped - ordered 13 days ago! I spoke with them today, they are shipping tomorrow. So, it will be next week before the order arrives. I need the gasket and seal set so I can rebuild the gearbox. Haven't heard from CNW on the crankcases either so can't build the bottom end. I guess I'll work on the frame while I wait. September 8, 2018 The heat is finally gone but now it's raining a lot. The engine/gearbox cradle was covered in grease and grime and where not greasy, rusty. Once I cleaned it I realized that about 90% of the paint was in good shape so I didn't blast it. I sanded down all rust and smoothed all chips in the paint and spot primed with sandable primer. Then I gave it an overall sanding and finally several coats of paint. Looks great now and the gearbox can go in it as soon as it it done. Between steps on the cradle, I worked on the frame. The steering head bearings are out and the VIN tag is removed. About 1/3 of the frame is cleaned, sanded, and primed. 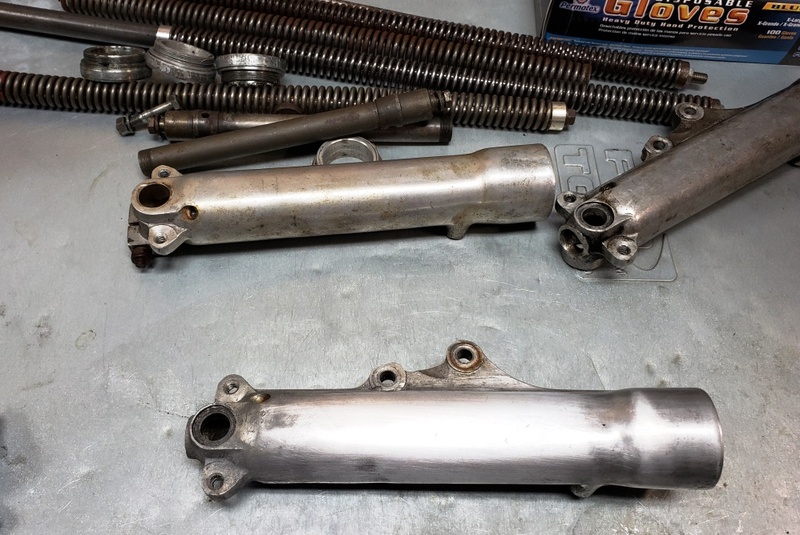 Since Norton frames are one-piece, I can't blast them so I refinish them in sections. It sure is nicer to work on Triumphs that are not OIF since I have a blast cabinet big enough for those frames. September 9, 2018 The frame is now clean, rust free, and primed. As soon as there is a lower humidity, wind free day, I'll hang it up outside and paint it. I can prime in the shop because I do little sections at a time and hold a piece of cardboard behind the area being primed. While possible with paint, the paint I used must have all coats within an hour so it's not possible with that paint. It's the only single-stage paint I've found that looks original and is strong. September 16, 2018 The Andover order arrived Friday and I started building the gearbox yesterday. In case you're wondering, building a gearbox when you have everything is about a hour job to the point in the picture. I know how to do it, but was really starting to think that I forgot! I must have put it together 30 times. It would turned freely and go through all gears until I put the inner cover on. I kept thinking I had some gears switched or some bad gears. I gave up yesterday and decided to start fresh today. Same thing. 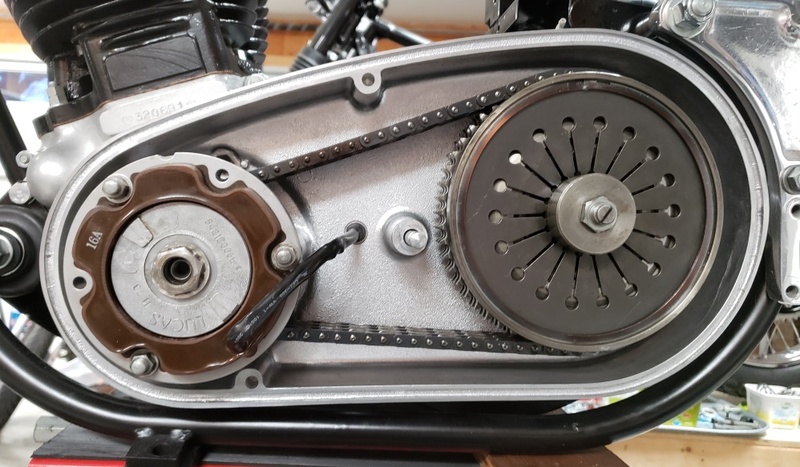 Then I noticed that without the inner cover on, when I turned it by hand that the mainshaft 1st gear would move up and down - strange I thought. Then it hit me - I couldn't believe it! The mainshaft is bent! How it was possible to be bent and a running bike when last parked is beyond me - I'm thinking that it wasn't - I think the last person couldn't get it working and parked it. The bend is between the 2nd and 3rd gear. Fortunately, I had a good spare mainshaft and thirty minutes later it looked like the picture, layshaft properly shimmed and everything torqued. I'll polish the outer case, install it, and it will be done. September 20, 2018 The heatwave finally broke! I've working on multiple things. The crankcases are finally on their way back so I started on the crankshaft. Notice in darkness in the 1st picture on the mating surface of the flywheel. Whoever last had the crank apart covered the bolts with something like gasket varnish. It seeped into the mating surface and in various areas on the outside. The crank was certainly not straight due to this. A great deal of time has been spent with a brass brush, WD40, and alcohol to get it off. It's a little hard to tell in the 2nd and 3rd pictures, but it is gone even though the metal is stained. In the 3rd picture, everything is spotless and ready to go together. 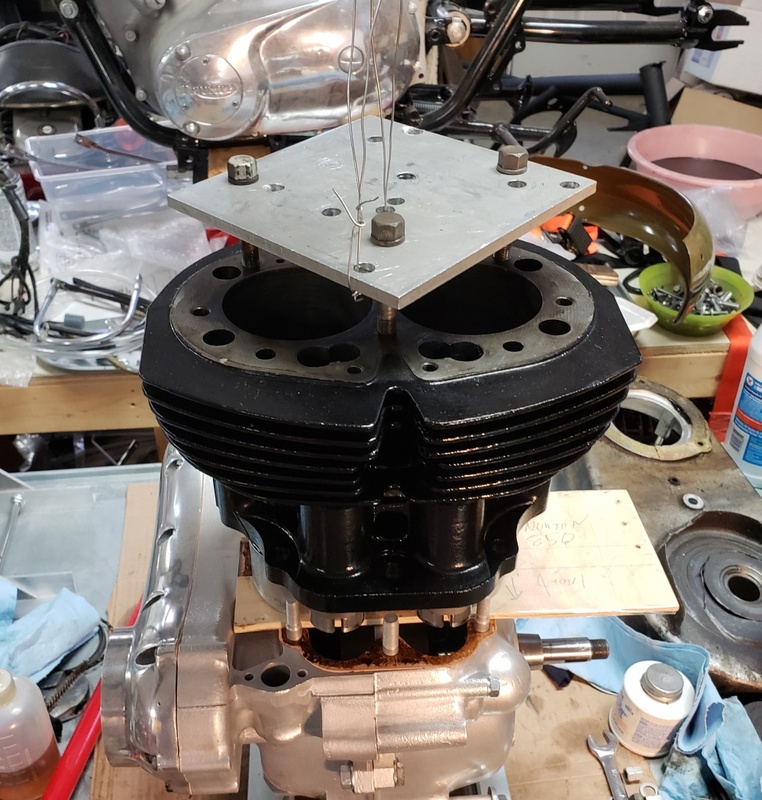 In the 4th picture, the crank is back together and the rods are ready to go one.They have been cleaned, a couple of small nicks removed, and polished. They have some discoloration, but are in great condition as are the journals. I ran out of time today. I'll put the superblend bearing races on and then the rods and the crank will be ready to go into the cases. September 23, 2018 Not a good day! 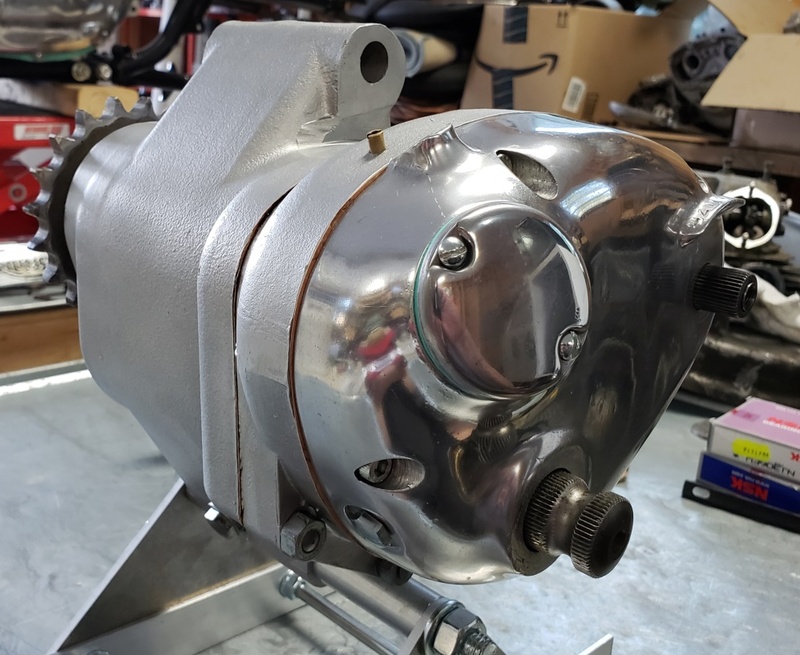 Spent a long time polishing the best outer gearbox cover I have, changed the seals, inspected, cleaned up, and reinstalled the gearchange mechanism and installed the outer cover. Tried to do the final test of the gear changing and the gearbox wouldn't turn - AGAIN. I guess I should have known - bent mainshaft without bending the layshaft, in hindsight, makes no sense. So, it's all got to come back apart to replace the layshaft. Fingers crossed that I can get the bearing race off the layshaft without hurting it because I don't have a spare bearing. At least I tested before putting the gearbox in the cradle! September 28, 2018 The weather is finally nice! I finally got the gearbox built and working properly - what a nightmare! Tried about 20 ways to get the layshaft bearing off and finally modified a puller that worked without damaging it. Then I screwed up repeatedly on the shift quadrant. Sometimes, the simplest jobs take the longest! September 29, 2018 Finished cleaning and inspecting the crankshaft and conrods. 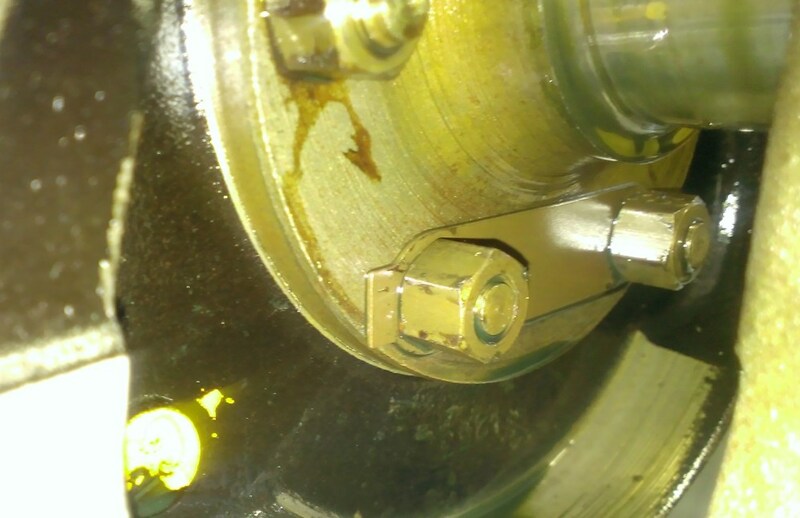 The first picture shows me heating the inner drive side bearing race. I didn't heat it enough the first time and had to try again - dropped right on the second time. The timing side went on without problem. The second picture shows the crank ready go to in the cases. The bearing shells were fine, but I always replace them - they don't cost that much. Of course, I used new nuts. September 30, 2018 Pretty good progress today. The bearings went in the cases without trouble. I had to restore the top front and rear crankcase studs but that's not hard. The cam key was destroyed when I took it out, so I had to use a spare that was nicked up. Spent a while recovering that but again not a big deal. I never realized that the cam can come out of the timing side bushing with the key still in it - I won't take them out in the future. In the picture you can see that it's all together. It's not torqued and I didn't put the oil pump on because the timing chain is more worn than I thought and the adjuster is at it's limit. I have a new chain that I'll have to put on so now I have to go through the PITA of getting the cam sprocket off, again. 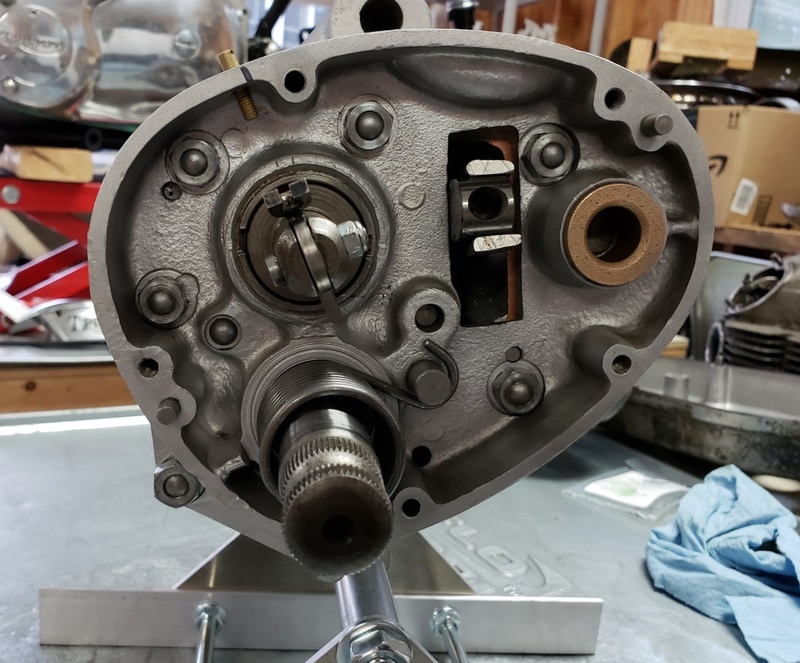 Also, CNW was out of the reed valves so they sent the cases without it and said that they would include the valve and plug kit with the oil tank - not sure where the plugs go so I'll wait for that before redoing the timing chain. 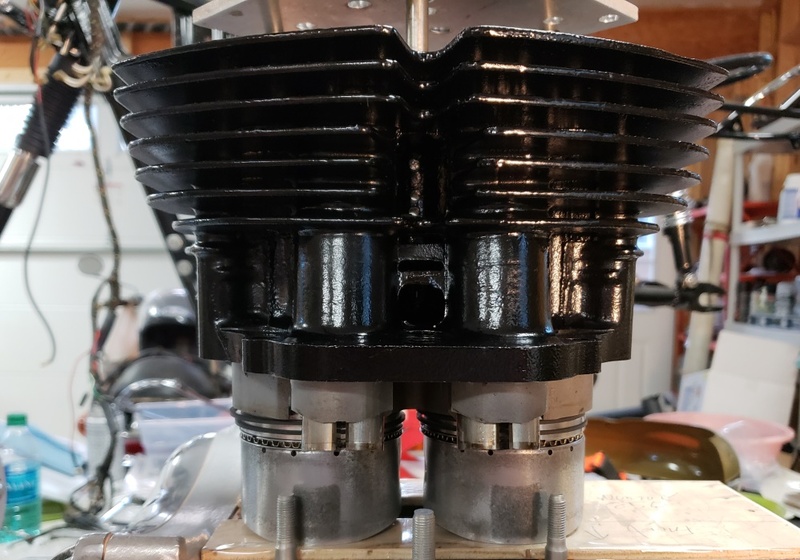 October 2, 2018 The oil tank arrived from CNW, but they forgot to include the crankcase reed valve. I called and they put in in the mail today. Removed the broken stud in the cylinder block and searched my spares for a replacement - found one along with a correct nut. Removed all carbon from the pistons and polished them. I'll a little more and do a final cleaning before installing them. At the right angle I can see myself in the left one but it has a couple of fine scratches. The right one is stained but no scratches. 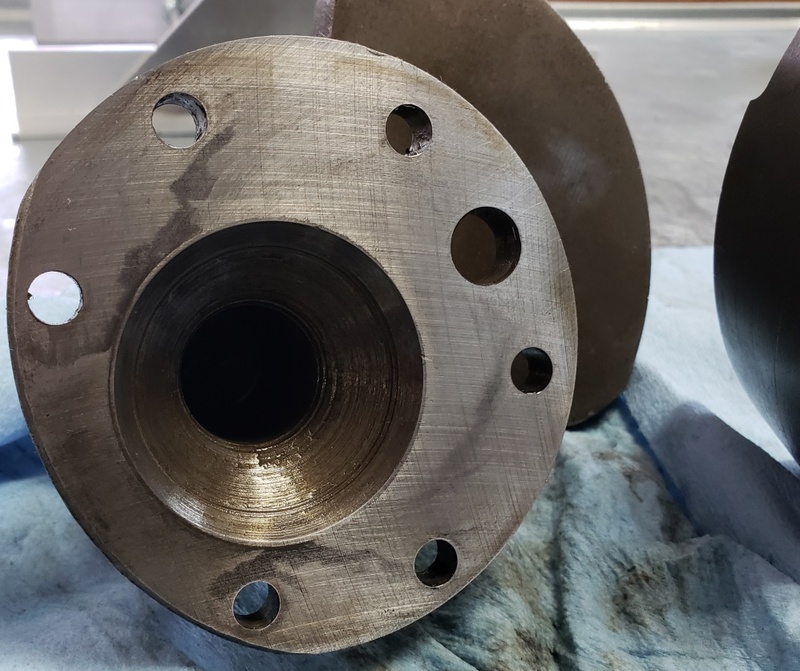 The oil drain holes in both were completely open, but the small oil holes on the right one were clogged with carbon and the carbon was thick on the right one as well. These pistons and cylinders are standard size and clearly had very few miles - I think the oil control rings on the right one were bad. I'll carefully check all that. Need to scrub and paint the barrels, and lightly hone them. Hastings rings are on order. October 4, 2018 Waiting for parts and more importantly, I can't walk! Saw the podiatrist today, got a shot, and some pills. The weekend is supposed to be nice, I'm hoping my right ankle decides to be operational again soon! October 10, 2018 I'm recovered and can walk again. The weather is still sticky and that in combination with my foot problems has slowed progress. The reed valve parts and rings came in. Installing the reed valve was more work than is was supposed to be, but I got it done. I did have to take the timing side all back apart to install the plugs. 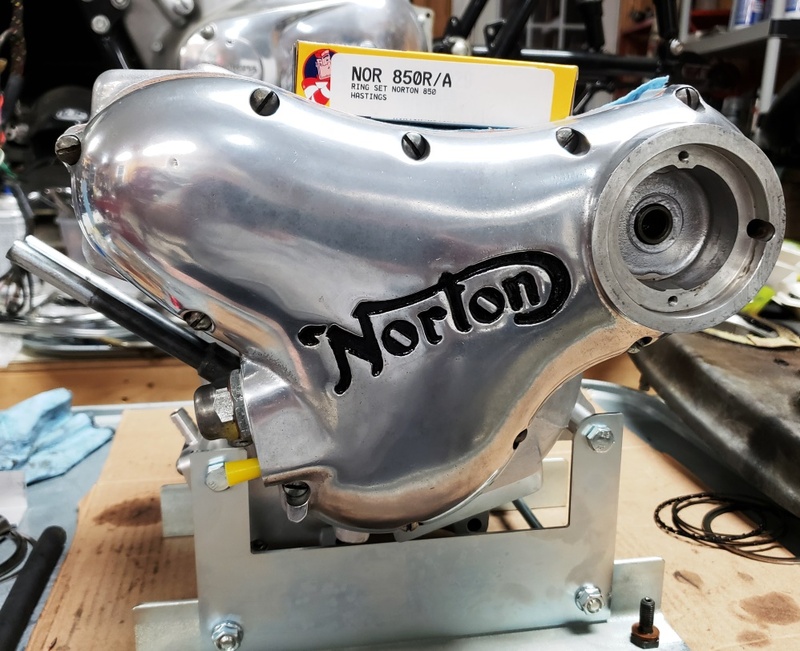 It's back together again and I polished the timing cover, painted the inlaid Norton logo, and installed it. I forgot to order new screws so I'll either polish or replace them later. As with other things, the oil pressure relief valve was so tight that I thought I might have to replace it - I finally got it apart, cleaned,and installed. 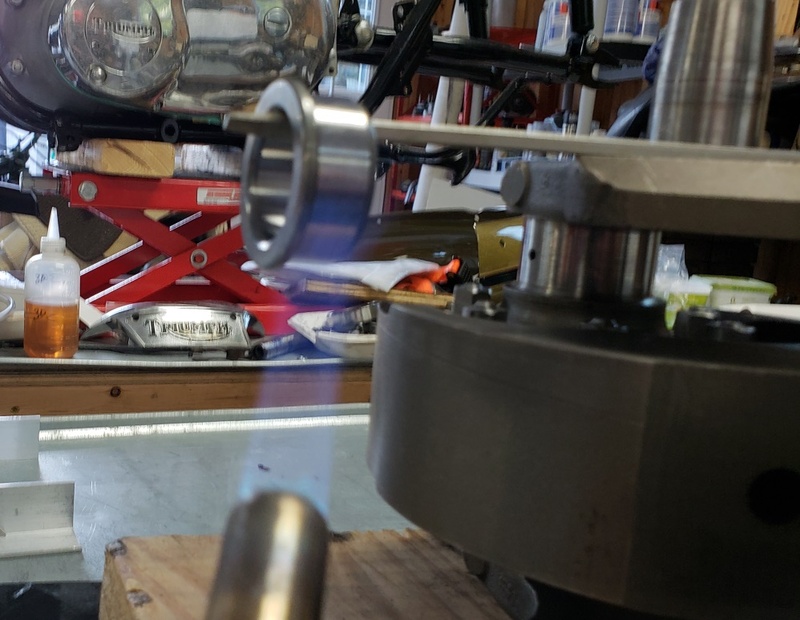 October 12, 2018 The cylinders are blasted and masked. All coats of the barrel paint must go on within an hour so I'll paint them tomorrow. When I paint, I line my power coat cabinet with cardboard so I can collect the overspray and paint inside. Between the top two boards holding the cylinders is a lazy susan bearing so I can turn them as I paint. I have them elevated to I can spray upward, straight, and downward. Getting cylinders fully covered takes many light coats for many angles. For Norton cylinders complete coverage is really important since they are cast iron and rust easily. October 17, 2018 I painted the cylinders on the 14th. The look much better in person than in the picture below. Today, I honed them lightly and thoroughly cleaned them. They are ready to go on but I'm waiting for new nuts - the ones that came on the parts bike were somewhat mangled. October 21, 2018 I've been fretting over how I would install the cylinders by myself. With my messed up shoulders and weak arms, there is no way I could hold the cylinders with one hand and compress the rings with the other as I used to do. I didn't do a good job with the first picture below - the cylinders are hanging from my engine hoist. In the second picture, the piston support I made is showing and I'm about to compress the rings and lower the pistons. This worked out very well and I'll do it this way from now on. Next I'll restore the head and install it. 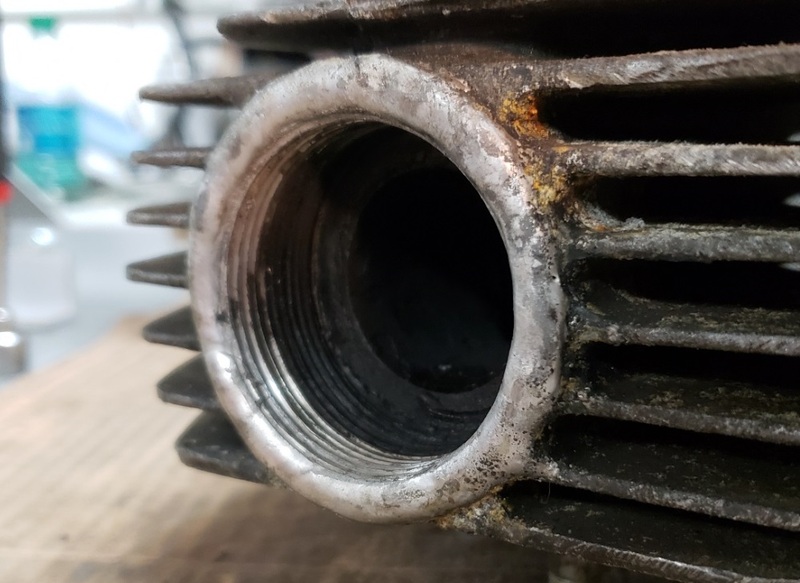 October 26, 2018 The exhaust threads are usable but the timing side had a weld repair and the drive side doesn't look great. 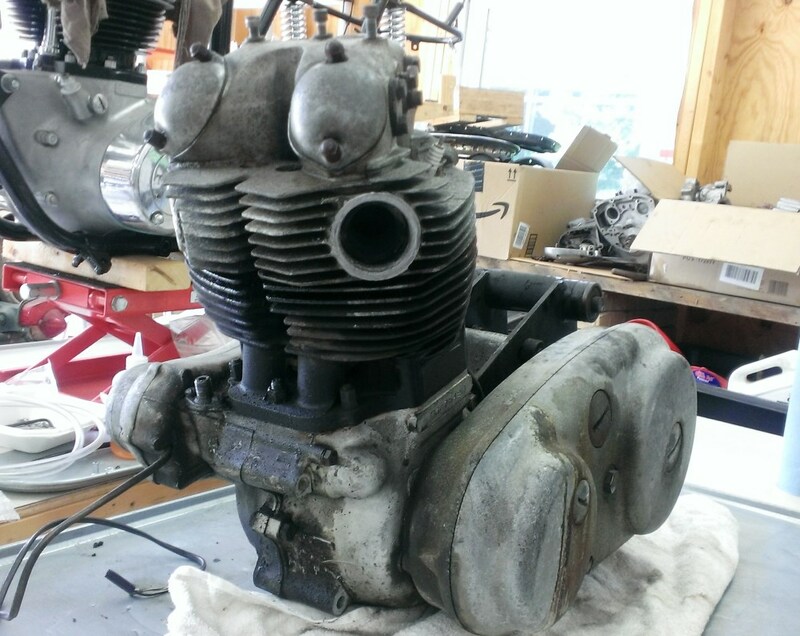 So I stripped the head and sent it off to have the exhaust ports properly fixed. 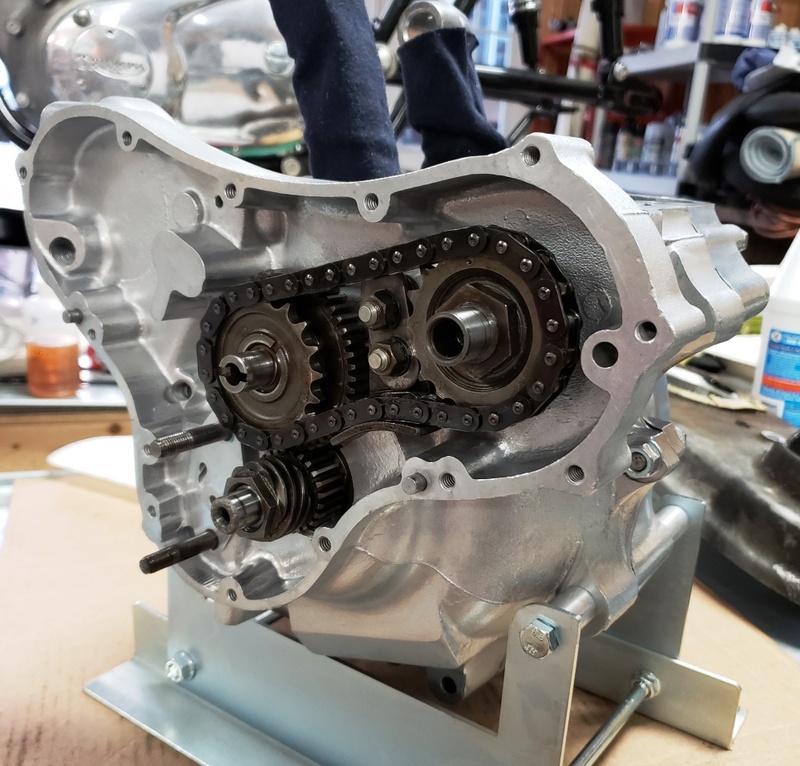 October 28, 2018 While waiting for the head, I put the gearbox in the cradle. 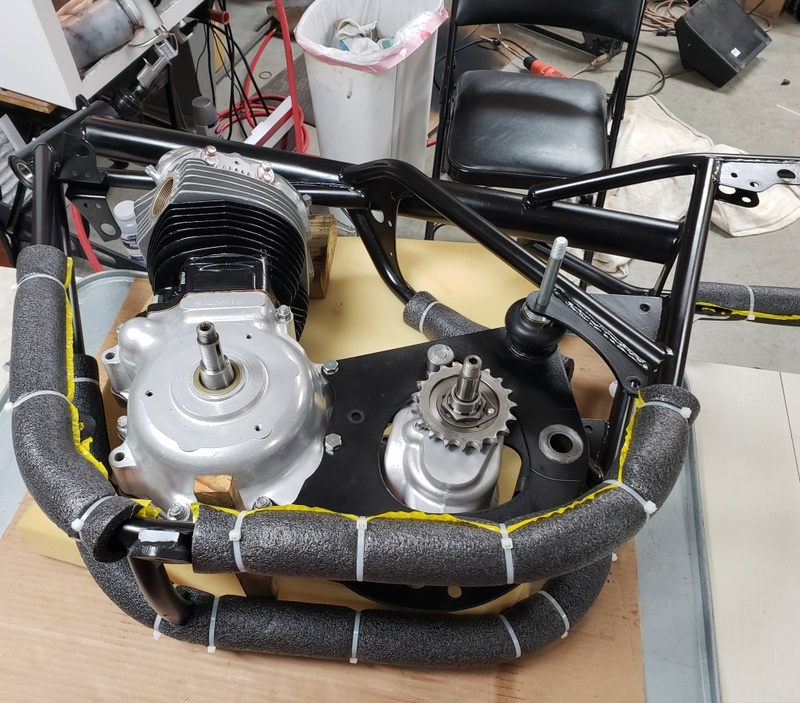 I won't put the engine in until the head is installed and the frame is ready. The engine leans forward and it's heavy enough that it will fall over. I have the frame about 1/3 sanded and primered. November 2, 2018 Still working on the frame as time allows. I sand a section to get rid of any rust and paint scratches and then spray some sandable primer. Once the entire frame is done that way, I'll give it all a light sanding and then final paint. I have to do it this way because I have a sand blast cabinet large enough to do Triumph frames, but not a Norton frame. 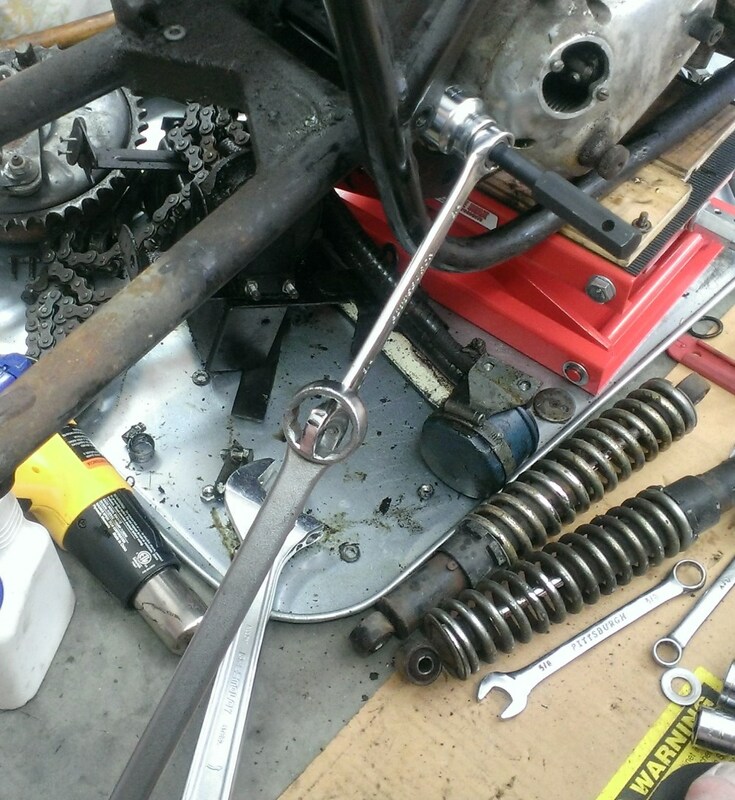 Triumph frames, except the oil in frame types, bolt together in the middle. I bought my cabinet to do them but other than one Trident frame, they have all been frames that won't fit :-( I wish I had thought about that when I bought the cabinet - $200 more would have covered a cabinet big enough for any British frame! 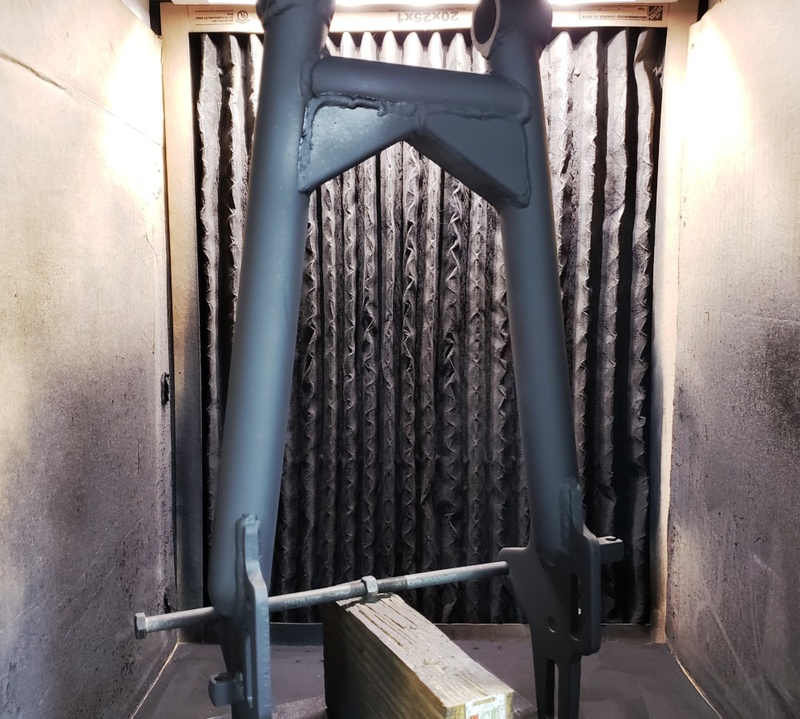 November 3, 2018 Five hours of effort and the rust and scratches are gone, the frame is primered and sanded. It's ready for paint. Now I just need a mild day without wind to paint it. I wish I had a place inside to paint, but I don't. November 4, 2018 The frame is painted. It's hanging from my shop crane. I know there are some areas where overspray took away from the gloss and there could be areas where the coverage is not good since I didn't have good light while painting. Once the paint is hard, I'll inspect and fix any areas needed. There's time since the head will be away another week or two. November 11, 2018 I inspected the frame and found a couple of areas where overspray made it dull. Those area have been lightly sanded and sprayed again. The frame looks great now. I will install the new fork neck bearings and the the new certification plate next. I won't install the triple tree until the frame and power unit are joined and I can't do that until the head is installed. I'll also powder coated the front isolastic mount. November 12, 2018 The head is back. The new exhaust threads look great and the messy weld repair is gone. The head is nicely cleaned. It's not any better than I would have done it myself, but it saved me a lot of time. I do need to give it a scrub and make sure each passage is open - I can see that the timing side exhaust drain hole is plugged. The second picture appears to show a crack but that's a casting flaw you'll find on many RH10 heads - no crack. 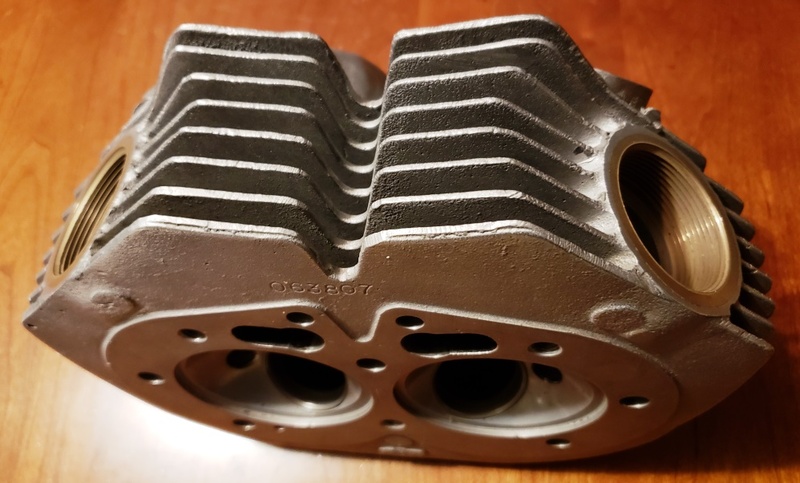 November 13, 2018 the valves are cleaned and lapped in and the head is absolutely clean. Big save! There was a ball from the tumbling in the timing side exhaust drain that would have caused major problems had I not found it. All threads are cleaned and all passages are completely clear. I ran out of time today so hopefully tomorrow I can finish building the head and maybe even install it. When I clean valves, I clean the stems, tape the stem to protect them, and then bead blast them clean. November 16, 2018 I was invaded yesterday by my grandson so no work done - even when they're grown they require attention :). The head is rebuilt and will probably go on tomorrow. It was just a few days ago that it was too hot and humid to comfortably work - today is was cold, snow, and sleet! 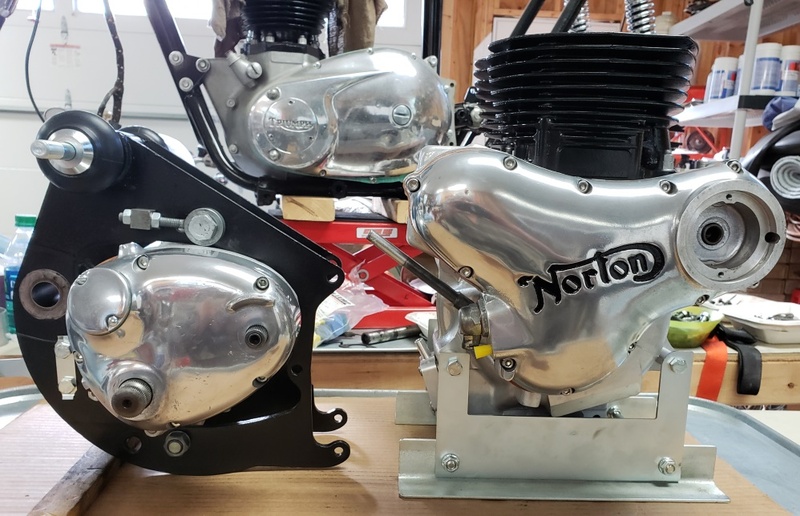 Fortunately heat is involved when installing the rockers in a Norton head! November 17, 2018 Super annoying day! I hoped to have the power unit in the frame today but was busy with other things. Once I got to the shop. I got everything ready and installed the head. 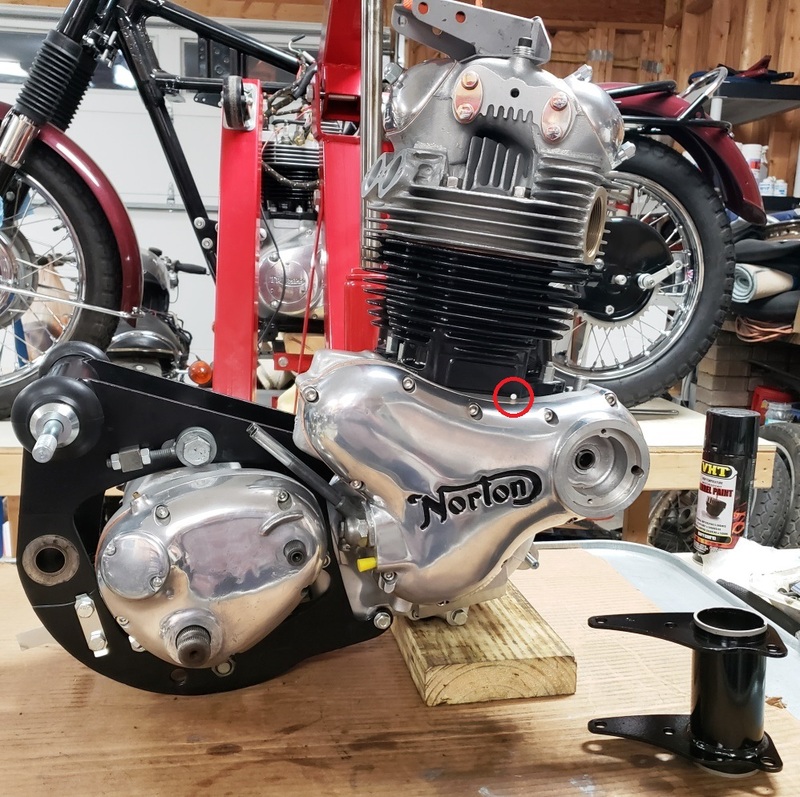 A Norton head is a PITA to torque due to the multiple sized wrenches and because you can't use a torque wrench for most of them. Once I got that done, I adjusted the valves and before putting the covers on, checked to be sure that the oil drains worked. The two exhaust drains worked fine. The intake side did not work at all! I spent so much time on the exhaust drains when I got the head back, I must have forgotten to check the intake side drain. Now I have to take the head off, correct the problem and go through today again. Of course, everything will be an oily mess now. So, hopefully I can catch up tomorrow. November 18, 2018 The engine is again together. Notice the red circle. That white ball was in the intake side drain. It's just like the one that was in the exhaust drain, but I could see the one in the exhaust. This one was deep inside and stuck. 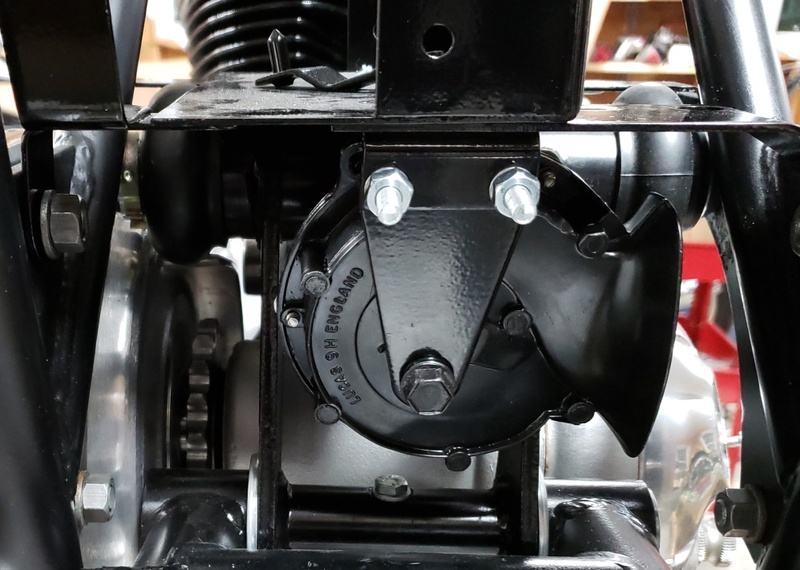 The power unit is together and the rocker covers are polished and installed. The head steady is temporarily installed so I can use my crank to support the engine. November 19, 2018 Made some real progress today! 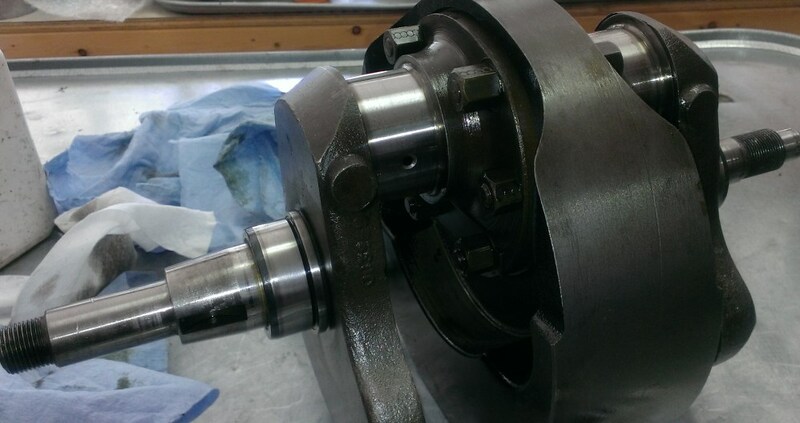 The first picture shows how I install new bearings in the steering head. I use a big bolt, four heavy duty washers and a nut. The washers are just a little smaller than the outside of the bearings. This is a lot better/easier than beating them in. 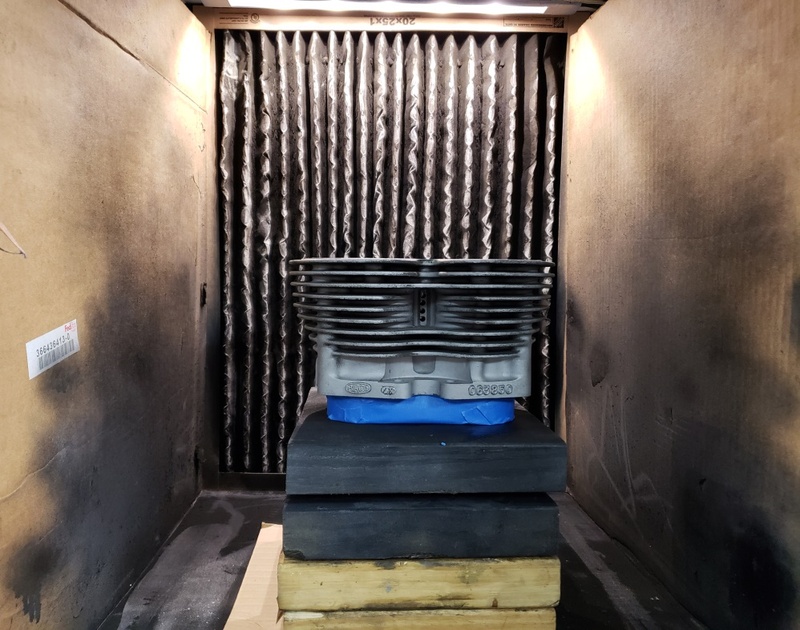 The second picture shows the power unit laying on the timing side on a thick piece of foam rubber and the frame lowered over it. The rear isolastic stud is in place and a piece of 1 by 2 is between the engine and frame. In the third picture the bike is upright. I ran out of steam. Next I'll assemble and install the front isolastic and I'll powder coat the head steady and install that. November 22, 2018 The front isolastic mount and head steady are installed. 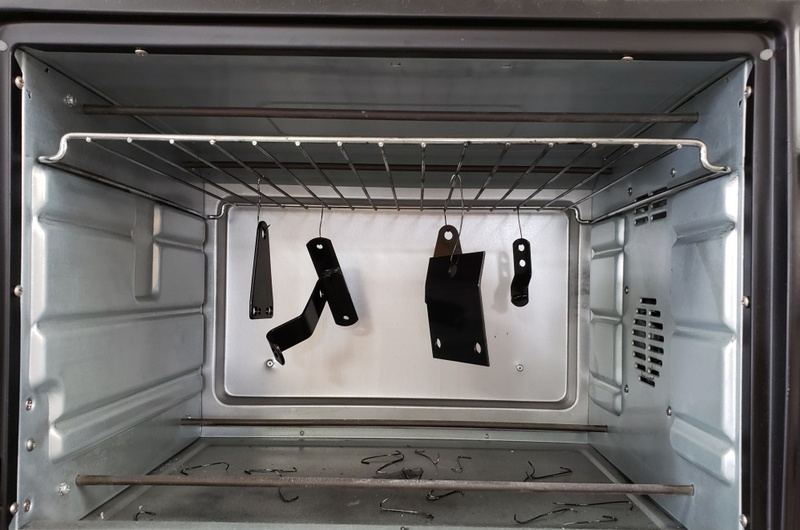 November 25, 2018 The swingarm has been cleaned, blasted, and partly primered. Also, the triple tree has been blasted and is nearly ready for powder coat. 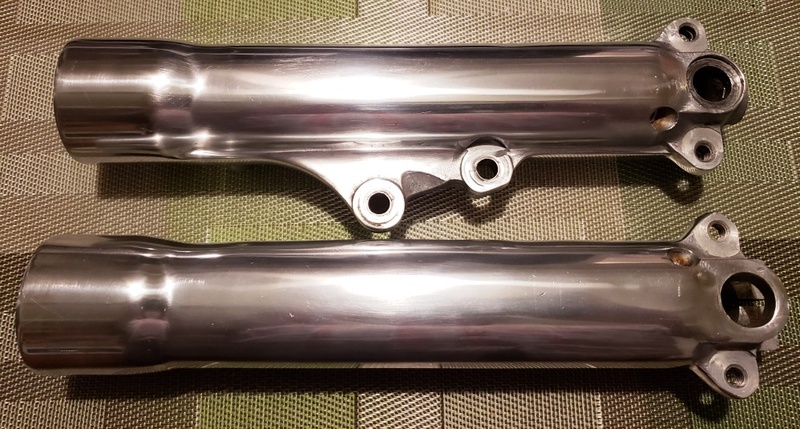 November 29, 2018 It has been really cold but I heated the shop enough today to finish primering the swingarm. 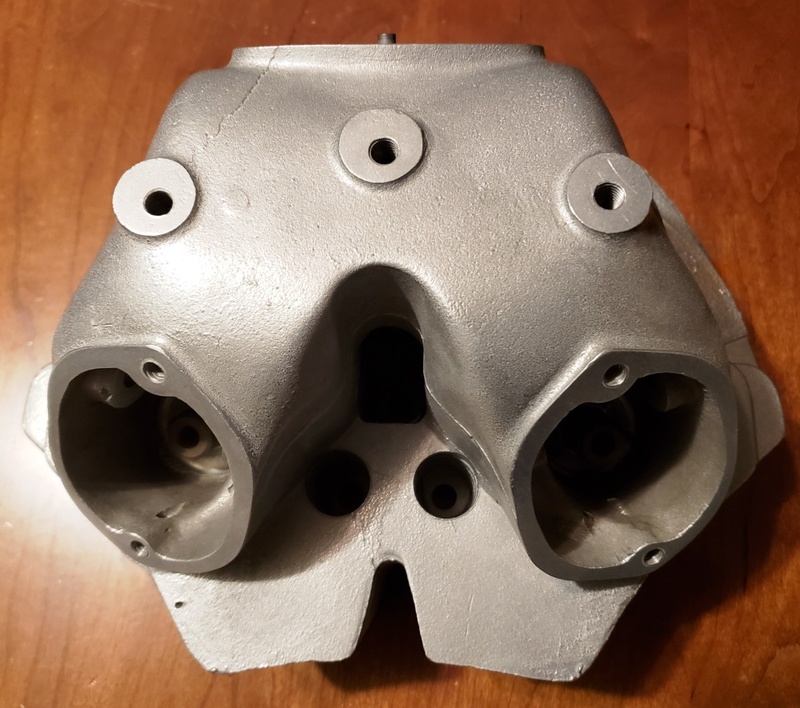 The battery tray was slightly damaged - that has been fixed and it is blasted and ready for power coat along with several small parts and the triple tree. I need a warmer day to paint the swingarm since it needs to be hung up so I can get to it all at once and I can't do that in the power coat cabinet. I'm starting to wish I had made the cabinet much taller! December 2, 2018 It was supposed to be sunny and 70 today - I would hate to be a weather forecaster - I couldn't stand being wrong all the time! It was cloudy, rainy, very humid, and only got to 54. I didn't accomplish anything on this bike today. December 16, 2018 I've been in the hospital again so not much has been done. I did get the shop somewhat cleaned up today, and some parts powder coated. Still stuck waiting for a decent day to paint the swingarm. I think I have everything needed to rebuild the front end so I may work that next. December 18, 2018 Started on the front end. 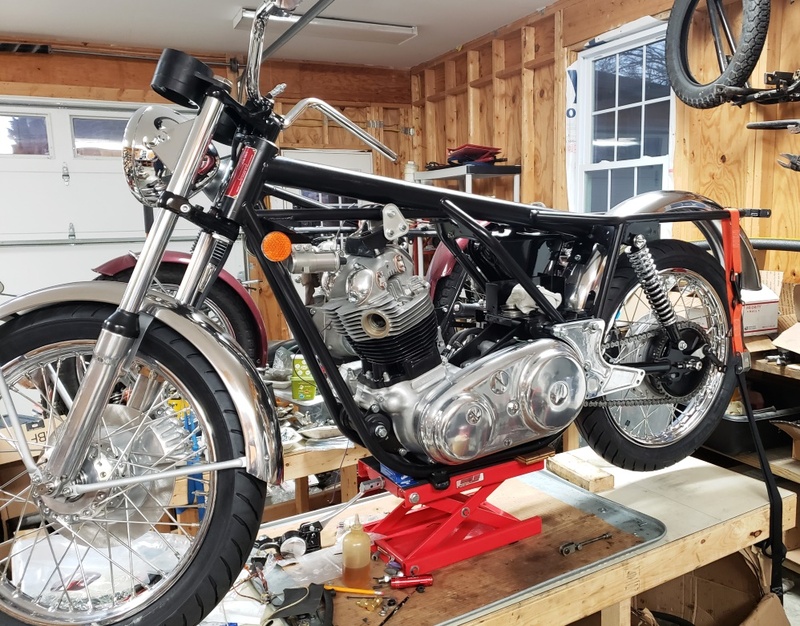 When I built the 72, the bottom yoke was bent and I didn't realize it until a lot was together so this time I put enough together to check - the forks are perfectly aligned so no problem here. Going through my fork sliders and internals, I have the parts needed (with some new). The better of the two caliper-side sliders had some scratches right where they would really show (2nd picture). 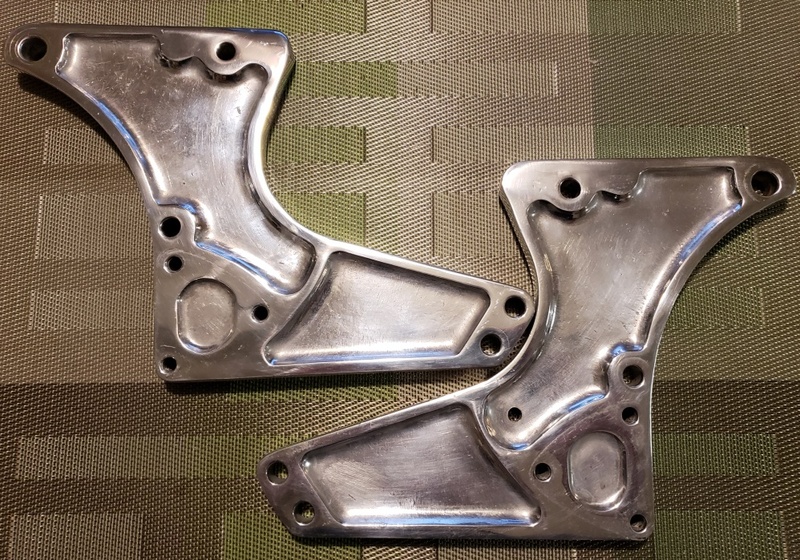 Those have been sanded out (3rd picture) and I'll do the buffing and polishing next. I have two sets of springs, one rusty from each. Rather than use the other of each set, I'll use new springs. December 20, 2018 One leg almost done. It just needs a few minutes of fine polishing. The other is dirty, but no major scratches so it will be easy to polish. The screw-in seal retainers for both sets of forks were removed with the wrong tools so I spent a lot of time filing and sanding. In the picture below, I have re-plated them. A few parts I need to finish the front end arrived today and the rest are coming from Andover Norton. I still have to build the front and rear wheels, but I have all the parts to do that (I think). 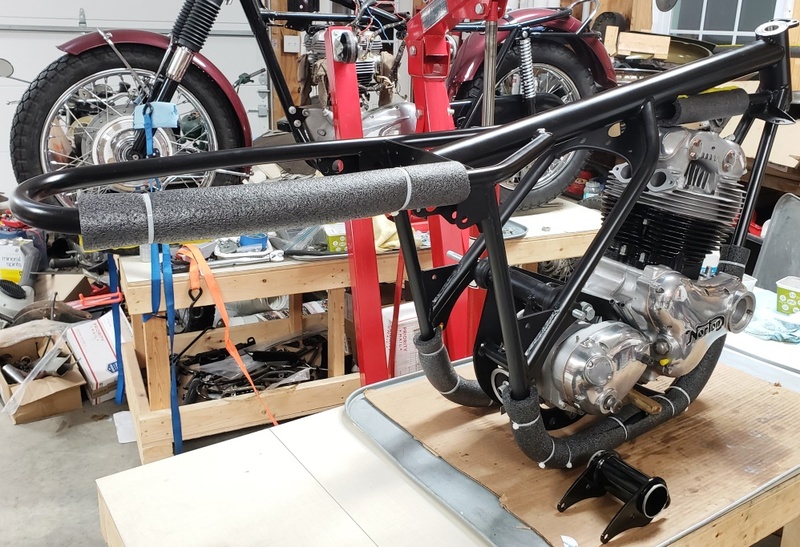 December 22, 2018 The fork legs are done and look great. It's a little hard to tell in the picture because the overhead light is reflecting off them. There are some fine scratches and nicks, but they look better than they would have coming off the assembly line so I am happy. The insides are spotless but that took a long time to accomplish. December 29, 2018 The holidays are almost over and I've finally made some real progress. I did some work in the past few day and was stuck because the o-rings I bought for the headlight ears were one size smaller than they were supposed to be so I couldn't get them installed. Once I got the right o-rings, it went together just fine. I forgot to refresh the speedo/tach holders so they are temporarily installed. I'll take them back off and probably powder coat them. Also, I have a new stainless axle I'll install when installing the front wheel. I still have to paint the fender stays. As with the 1972 Commando, I'll eliminate the jumble of wiring under the tank so I used a 3-bottom grommet headlight shell. I would hate to be a weather person - always wrong! 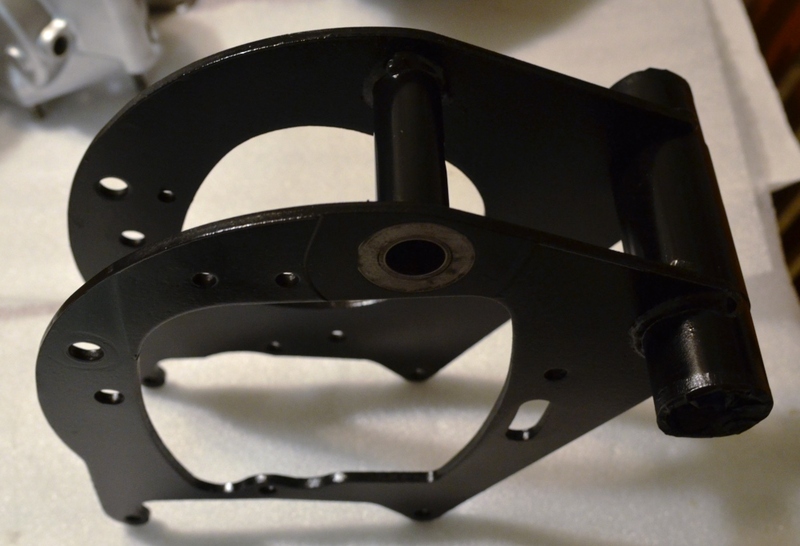 Yesterday was supposed to be in the 60s and sunny - I was finally going to be able to paint the swingarm. It was in the 40s and rained all day. Today started out about 60 with humidity about 50 - good, except that the wind was 15-25, gusting to 40. Finally at 3pm, it was 58 degrees, 58% humidity, and no wind. I need 60+ degrees and less than 60% humidity but figured that this might be my last chance for 2-3 months so I painted it. It looked great when I was done - if it still looks great tomorrow (doesn't flash), I'll be in good shape. 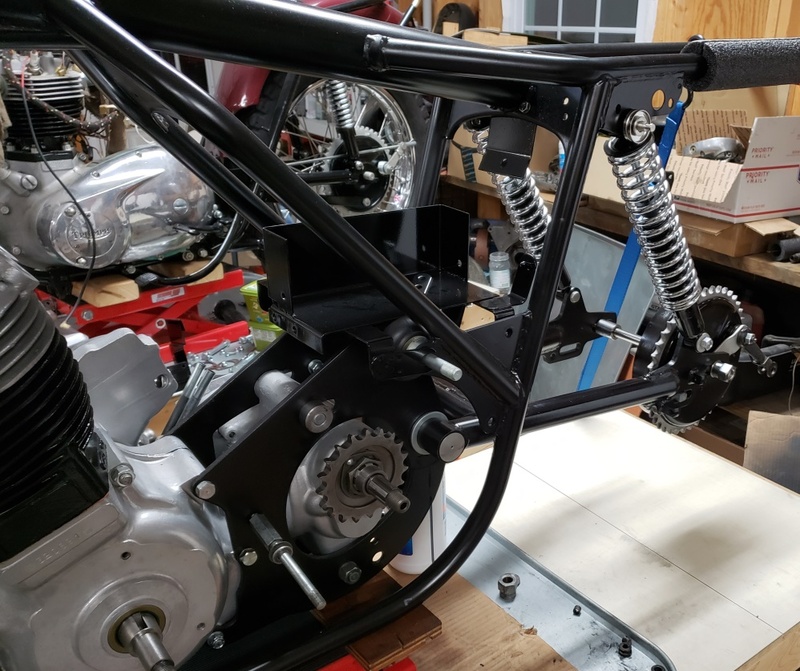 January 9, 2019 The swingarm looks good and it's installed now. I had some delay because the set of rear shocks I had set aside for this bike weren't right so I had to order more. 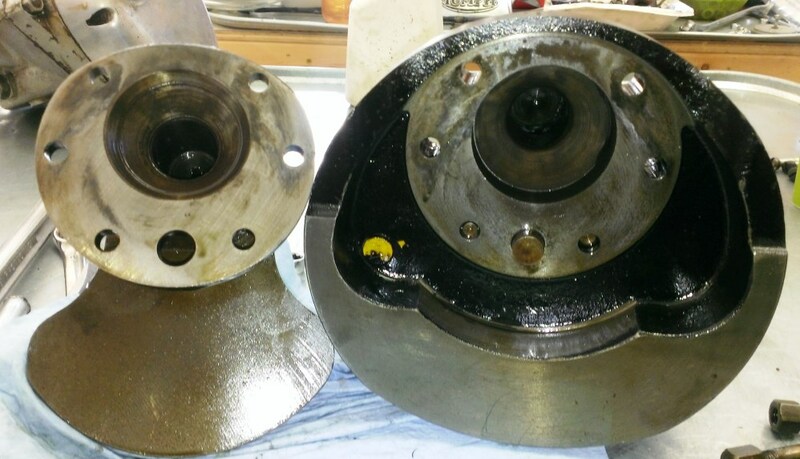 January 12, 2019 I've been working on the rear brake drum. As usual, it was extremely difficult to get the bearing spacer and grease seal washer out of the hub. 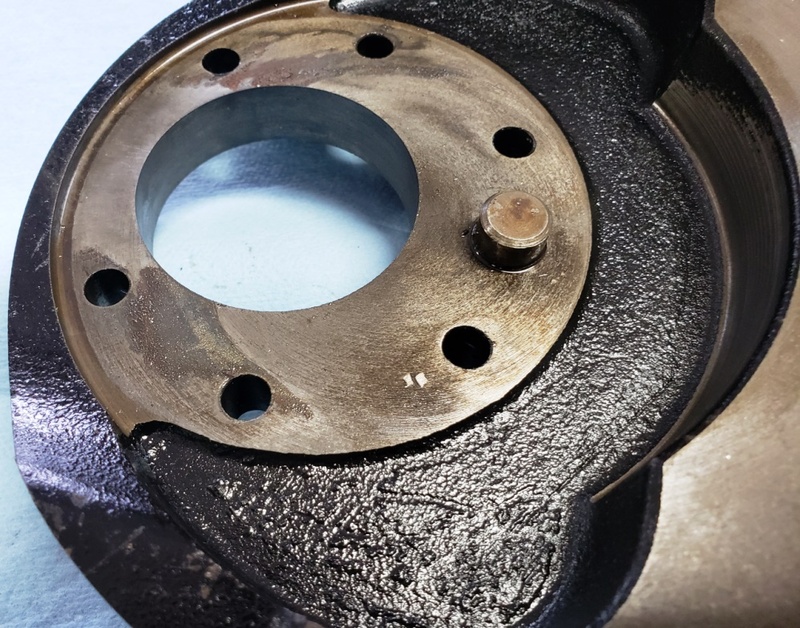 Once that was accomplished, I sand blasted the hub and brake backing plate and powder coated the brake hub. Tomorrow I can do the brake backing place and reassemble the rear brake. I'm missing the felt seal cupped washer so I can't quite finish it. January 16, 2019 The cupped washers came in. Tried to put the rear hub together - it's always something! The beautiful polished stainless steel rear axle kit I bought doesn’t work. It is supposedly for a 68-74 but really is for 68-70. If I had a lathe, I could fix it in 10 minutes. The original was over tightened (like everything on the parts bike) so the threads are not great. I’ll probably buy a 9/16-18 tap and die and improve the threads, then re-plate it all. It’s annoying because the complete new kit was not expensive and it will take me about two hours to renew the old one good enough to use. 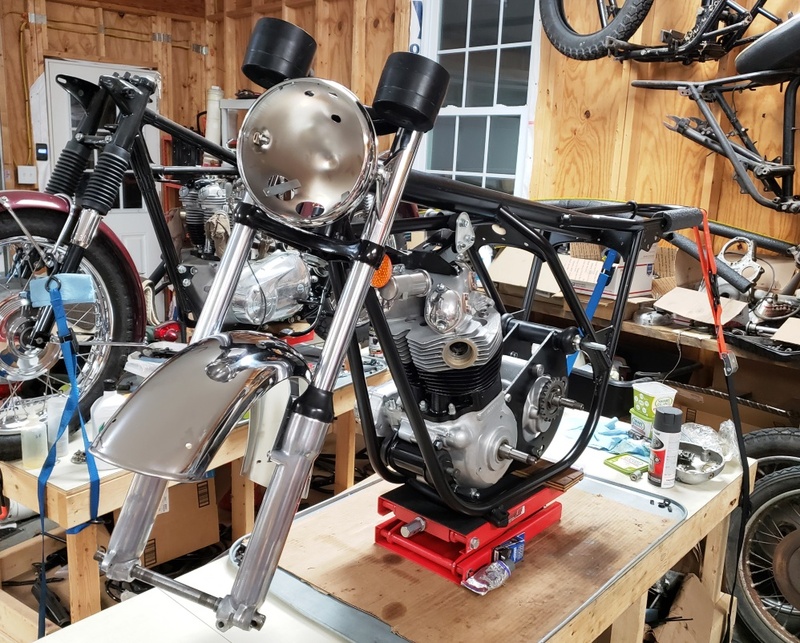 January 19, 2019 Got the caliper ready to go together. Lost the before picture - shame - lots of scratches, nicks, and dents. All gone now, but it took four hours. The "H" in Lockheed is not great in the original casting so there's nothing I can so about that. Also took the master cylinder apart, blasted it, and it's now powder coated so I'll build that now too. Figured out what to do about the rear axle. I'll used the new stainless kit parts but with the original dummy axle. The threads on the dummy axle are OK but need to be cleaned up - I have a tap and die on the way. 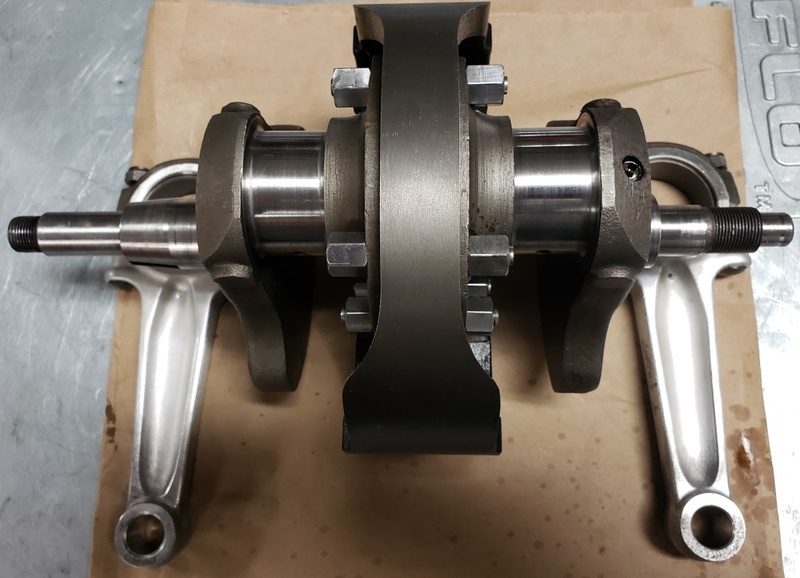 January 26, 2019 The caliper is finished an installed. I'm out of master cylinder seal kits, so I had to place an Andover Norton order - still waiting for that. I've powder coated a lot of little parts. I'm working on rebuilding the wheels now. Rather than document that here, I've made new pages. Look here for the rear wheel and here for the front wheel. January 27, 2019 Grrrrrrrrrrrrr! If you haven't looked at the wheel building, see my latest annoyance with the rear wheel. Who knows how long I'm stuck now! February 8, 2019. Cleaned up the Z-plates before buffing only to notice that the left side had a chunk out of it. I had others in a box but the only left-side also had a bad place. Looked around and found another that was so dirty that there was no aluminum showing. It came with the 72 and apparently laying in the dirt. Expected little, but once I got the grease and grime off it, it was perfect! February 9, 2019. The front wheel lacing is done - still trying to sort out the spokes on the rear wheel. To do that, we've become a Central Wheel Components dealer and have spokes on order from them. Also, I forgot all about the disc and sent it off to be surfaced yesterday. Hopefully that will be back by next weekend. Also it's still been too cold to paint the fender stays and I would like to install them before the wheel.. The rear brake is finished - forgot to take pictures while doing it. I power coated the brake plate and drum and it's installed enough to install the rear wheel if I ever get the spokes sorted out. Took a long time going through my Z-Plate collection, selecting the best set, cleaning, sanding, and polishing. The picture doesn't do them justice - they look a lot better than the new ones you can buy. February 15, 2019 The disc is back and today was unusually warm - 66 degrees so I was able to paint the center of the disc and the front fender stays. 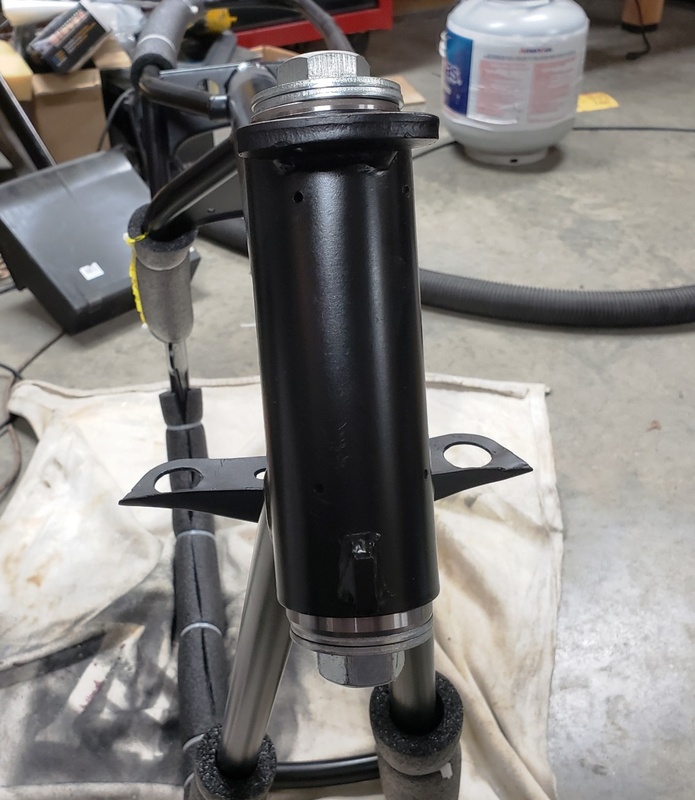 February 16, 2019 the master cylinder is rebuilt and ready to install. This time I had to replace every internal part but at least there was nothing wrong with the body. 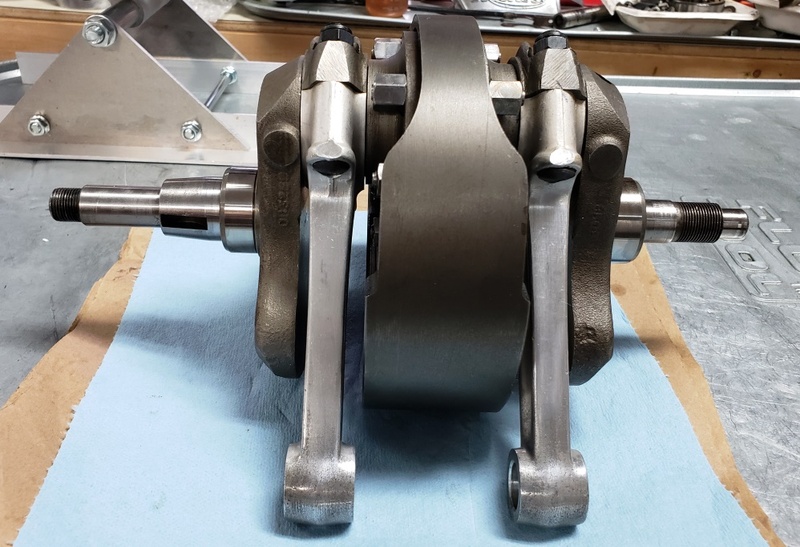 February 21, 2019 When I took the primary apart on August 26tth, I mentioned that the clutch looked new. I'm sure the entire clutch, primary chain and engine sprocket are new. 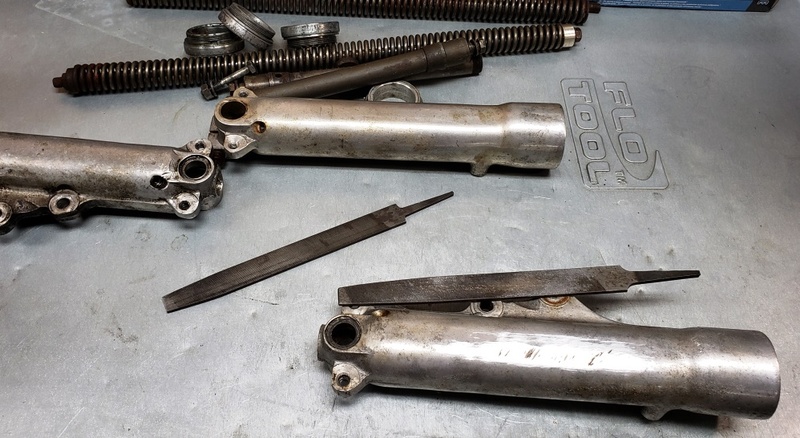 The fact that the gearbox mainshaft was bent on the timing side and the inner chaincase was torn up makes it clear that the bike did almost no miles since the primary components were changed. But there's always something with this bike! Look at the clutch plate on the right - a sintered bronze - as is the 5th one. The rest are meant for an 850, but are fiber on metal. I'm guessing that they are Barnett plates. All of the plates are the correct thickness - no wear. But I can't imagine putting different plates in and having the new owner think I cut corners. So, I'll put in a set of new sintered bronze plates. There are not many things good about being a widower, but building and balancing wheels on the kitchen table is one of them. That's done but I can't install the wheel yet. The new front fender from Andover Norton is not exactly the correct radius and a slightly different profile. I had to reform the fender stays and then repaint them. Still trying to figure out what to do about the radius being larger which effectively makes the stays too short. I'll attempt spacers between the fender and stays - 3/16" should do it. February 22, 2019 Well the set if sintered bronze plates I have that are supposedly for a 850 are not! 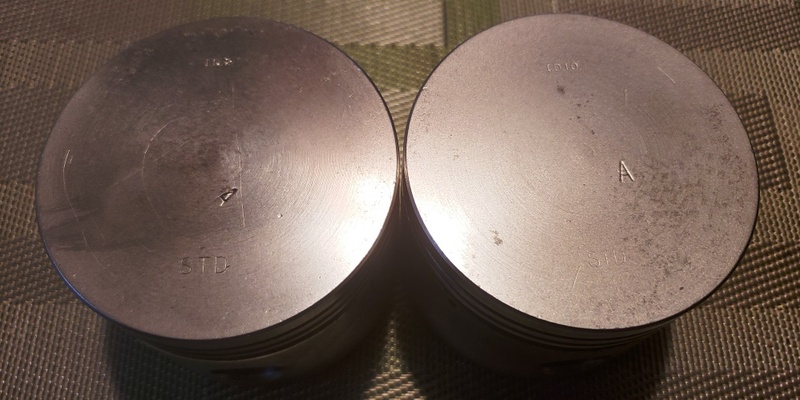 They are 750 thickness, not 850 thickness and I don't have a thick pressure plate to go with them so I'm on the look for a set of correct plates or three that match the ones I have. 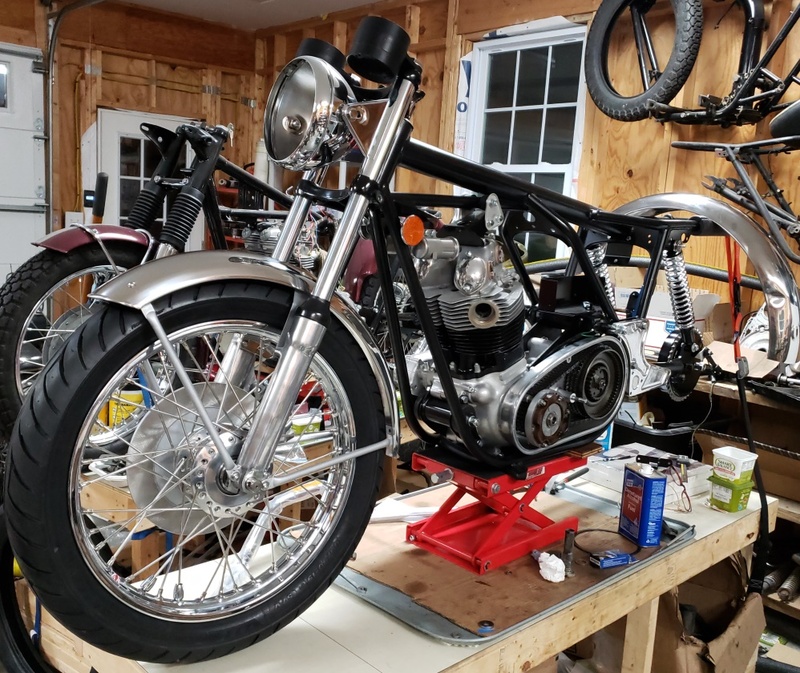 February 23, 2019 Got the front fender sorted out and mounted the front wheel. Still need to put in the pinch bolt. Hopefully I can make ground on the rear end tomorrow. I'm still waiting on spokes but I have everything else needed for the rear. I've made several offers for the clutch plate I need, but no one has accepted - they want too much. 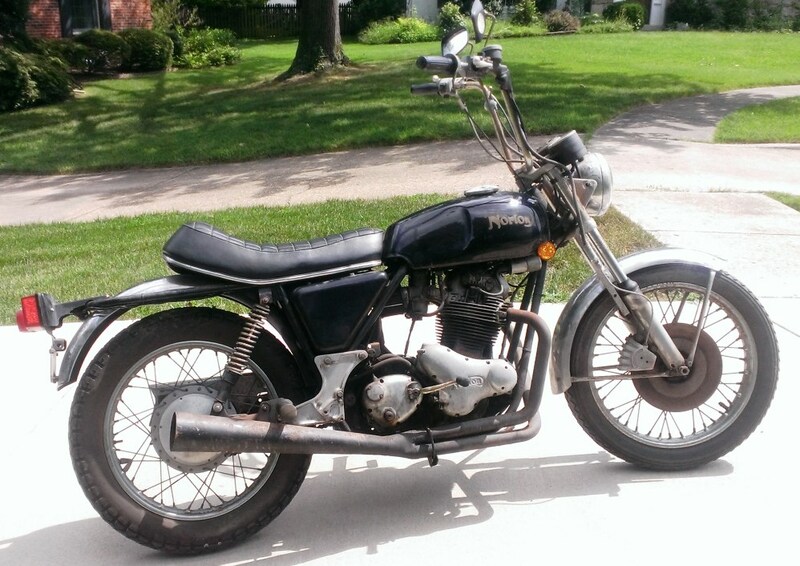 I've got to find exhaust pipes too and see if I have a speedo and tach already restored. I have the ones that came with the parts bike, but they will have to be restored and that a bunch more money. 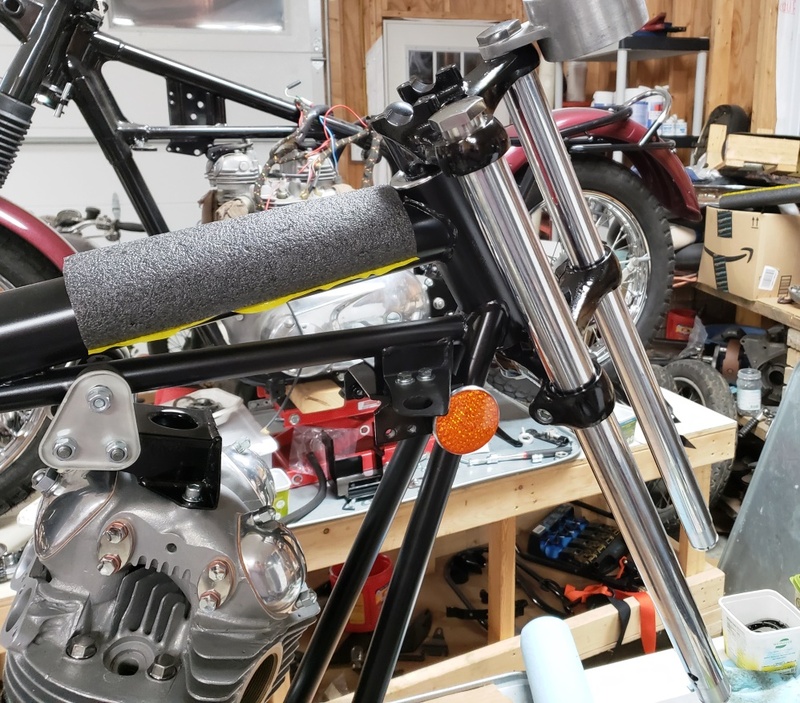 February 24, 2019 Power coated several more small parts needed to install the the handlebars, horn and rear fender. Then fought the Bundy for the front brake. These are never shaped exactly right and are always too short so they have to be straightened some and lined up to the hose to the master cylinder. I still have to take it back off and put the lock washer and nut on the hose - I didn;t have one today. Then came the real struggle! The horn that came with the parts bike works but most of the paint is off. I had another that I restored, but it never worked right so I decided to take the one from the parts bike apart and use its internal with the restored covers. Guess what - now that didn't work right. That's when I realized that when I restored the first one I had to make gaskets for it and that I make them too wide and that the tiny air hole in the diaphragm was being blocked by the gaskets. Once that was corrected, the horn worked fine. I'll restore the second one now. The second picture shows the horn temporarily installed. I need to make the wiring harness for it before I permanently install and installing the oil lines before the horn makes installing them easier. 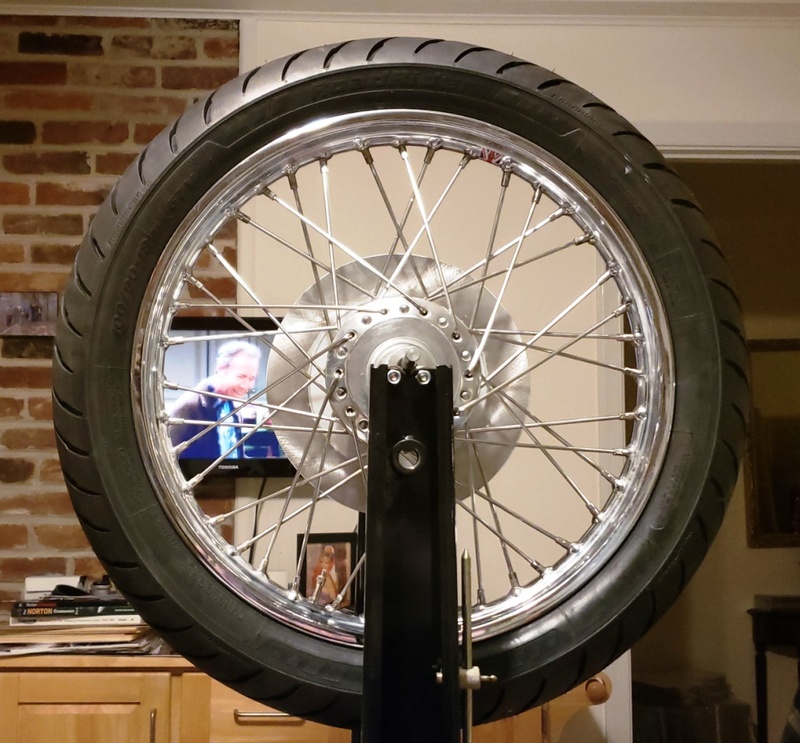 March 3/7/2019 The rear wheel is finally built. Waiting for a WM2 security bolt to arrive so I can mount the tire. Received a set of Barnett clutch plates today and finished the primary except for the cover. The primary cover was filthy and I've been keeping my eye out for one. Today I cleaned it and to my surprise, it's pretty nice. It has some small scratches and some black corrosion but I can make it beautiful. Spent about 30 minutes on it and it's already better than the one on my rider. 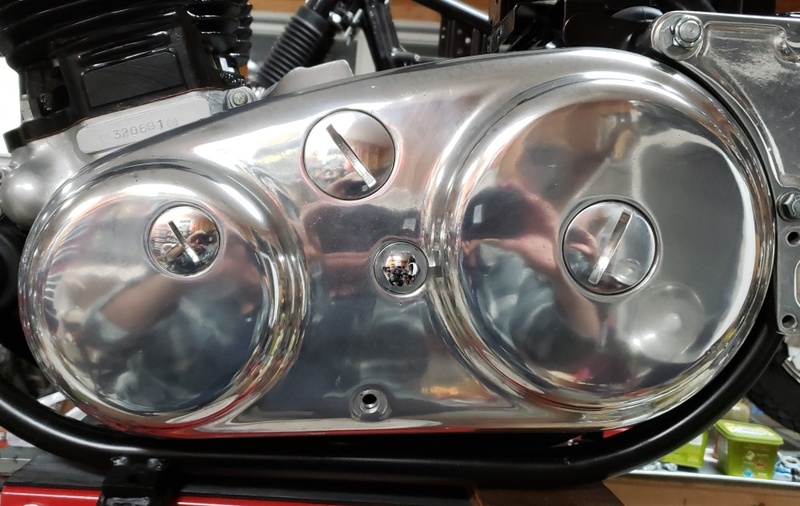 March 3/9/2019 After three hours of sanding and buffing, the outer primary cover is done. I didn't go for a mirror finish but as you can see it's nice. The level plug I have is a disaster - have to order a new one. 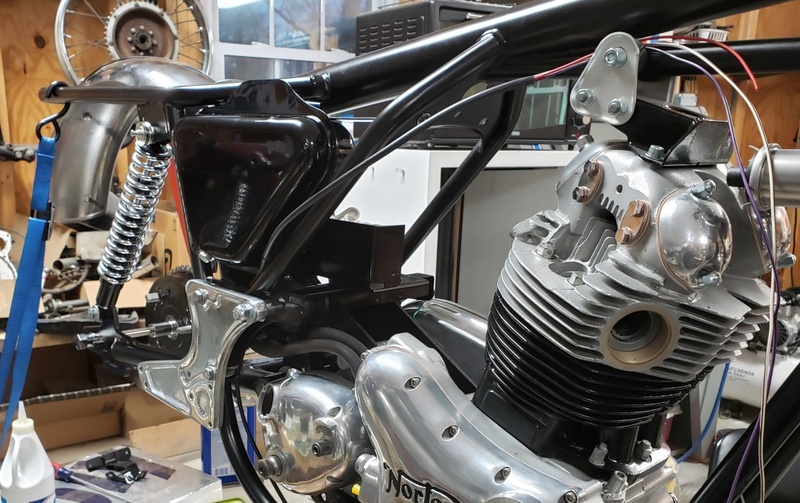 March 10, 2019 The oil tank and hoses are installed, the horn is installed, and the rear fender is in place but not tightened yet. I needed to make sure it was all going to fit right. Although I like to reduce the number of connectors wherever possible, I may add one to the horn/oil pressure cable. If I hard wire it into the harness cable, I won't be able to get the main harness off the bike for the final wrapping. 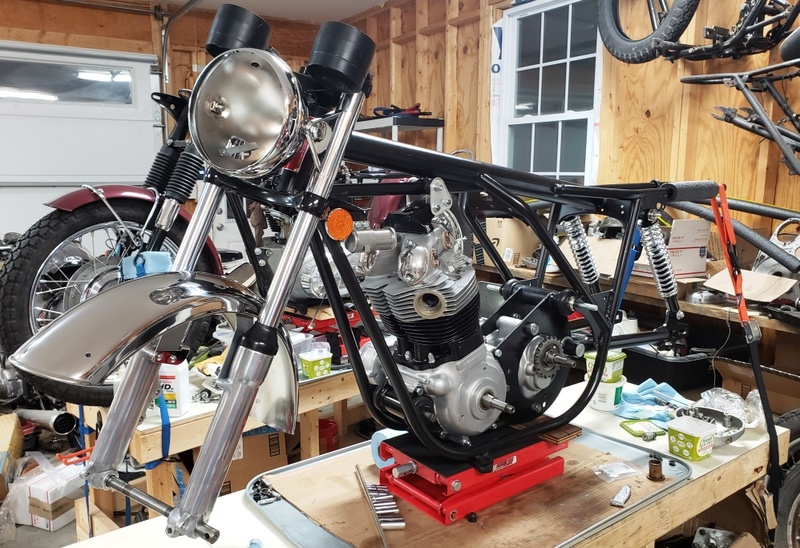 March 14, 2019 The rear tire is mounted and the rear fender is on as well. That was a bit of a struggle as the bolt slots were not in the perfect locations, but it did finally all go together with having to re-drill anything. 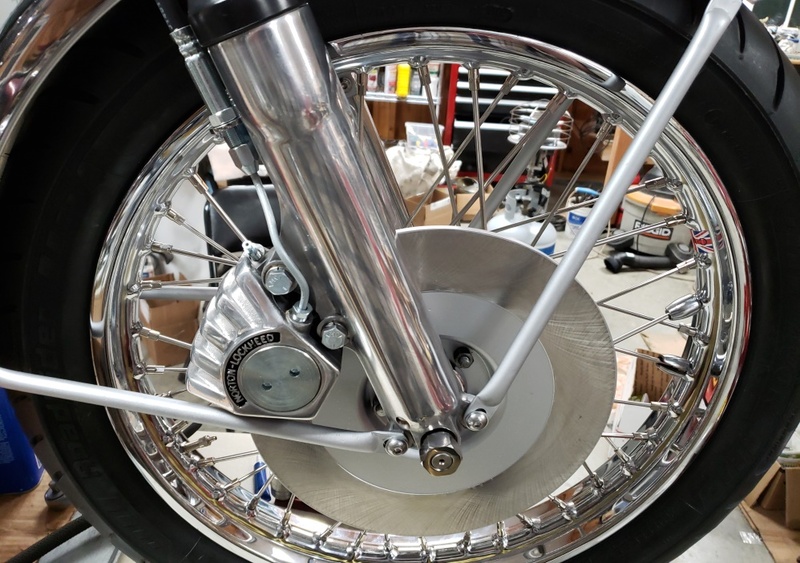 March 16, 2019 The rear wheel is on and the chain is cut to length and installed. I'll try to get some help and install the center stand tomorrow - need a third hand. 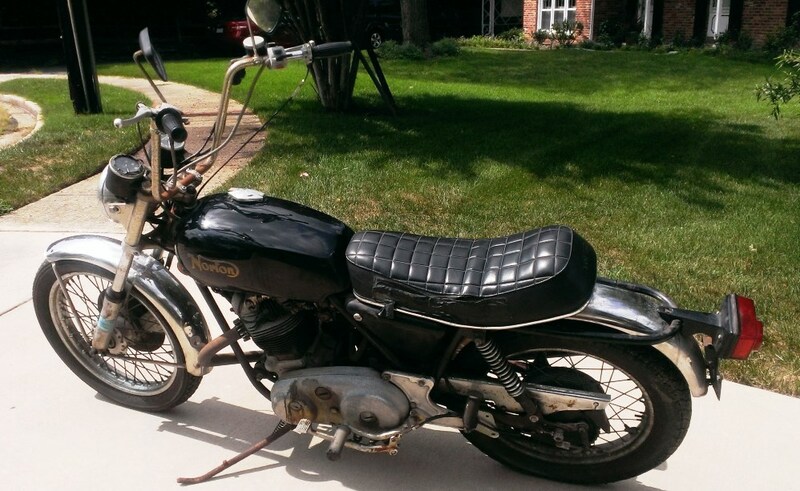 March 18, 2019 A customer got a really good deal on a 1970 Triumph Daytona (500cc, T100R). It was being restored when its owner died. Initially, it appeared to only need wiring and a few bits and pieces but it has turned out to be a little more so this bike lost its place in line and had to give up its table. 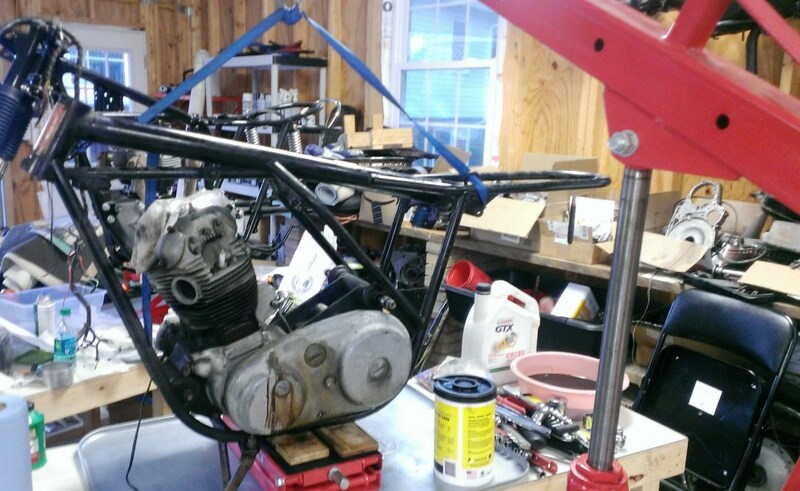 It shouldn't take too long to finish the Triumph and get this bike back up on the table. If you want to follow along with that, go here.